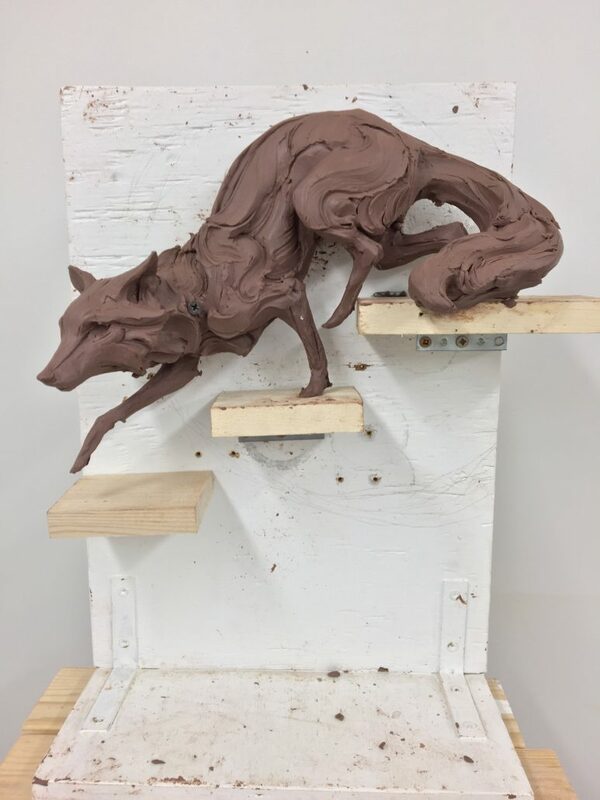 I spend the first several weeks or months of a new body of work writing about my ideas and creating 20 or more 3-D thumbnail sketches and maquettes for the main characters that revolve around a central theme for the exhibition. 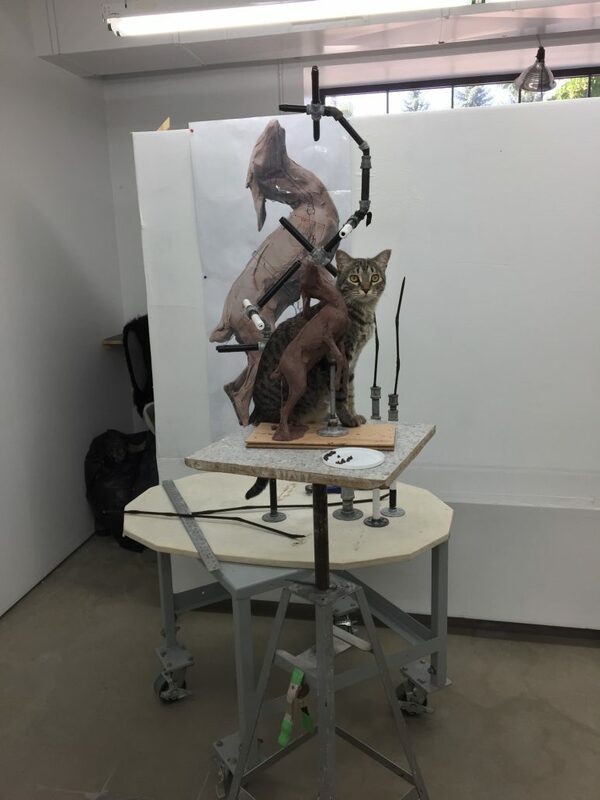 The size, shape, atmosphere, location, and culture of the exhibition space plays a key role in how the bodies of these 6-8 figures will occupy the gallery environment. 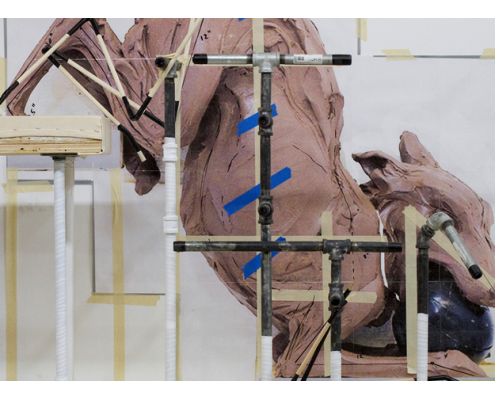 The way in which they interact with each other and the viewers becomes an important part of how the pieces are designed: scale, color, gesture, and architectural interaction. 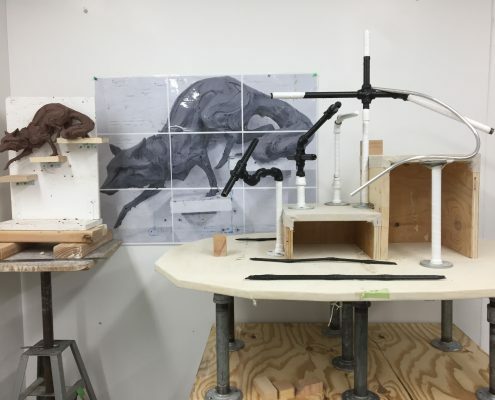 After the final maquette is put together, another 1-2 weeks is spent designing a pipe armature that will support the figure as effortlessly as possible in order to allow the most dynamic range of gesture and expression. 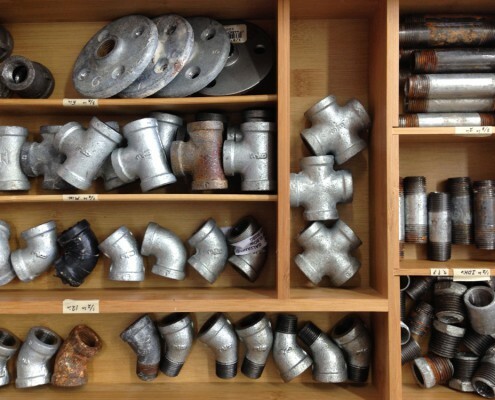 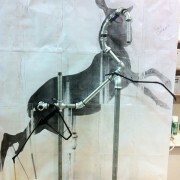 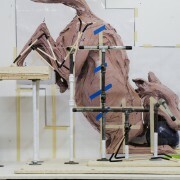 Part of that design means incorporating pipe joints into corresponding anatomical pivot points. 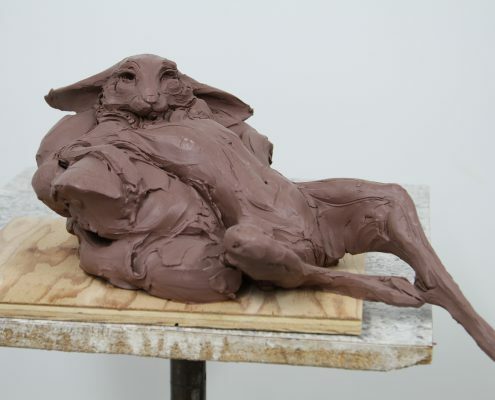 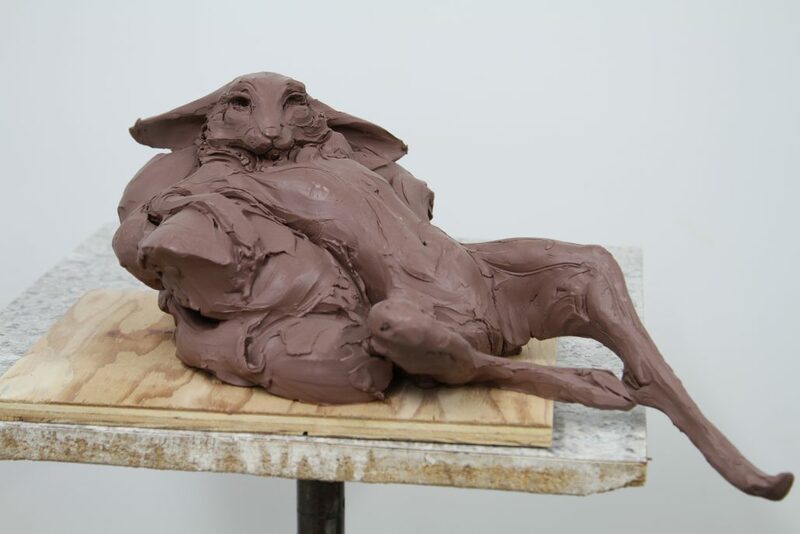 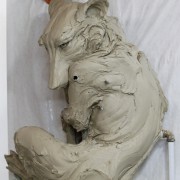 This way the solid mass of clay can still be moved and articulated during the sculpting process (ie: a joint in the neck so the head can be turned, joints in the shoulders and hips to allow for further articulation of the torso, etc). 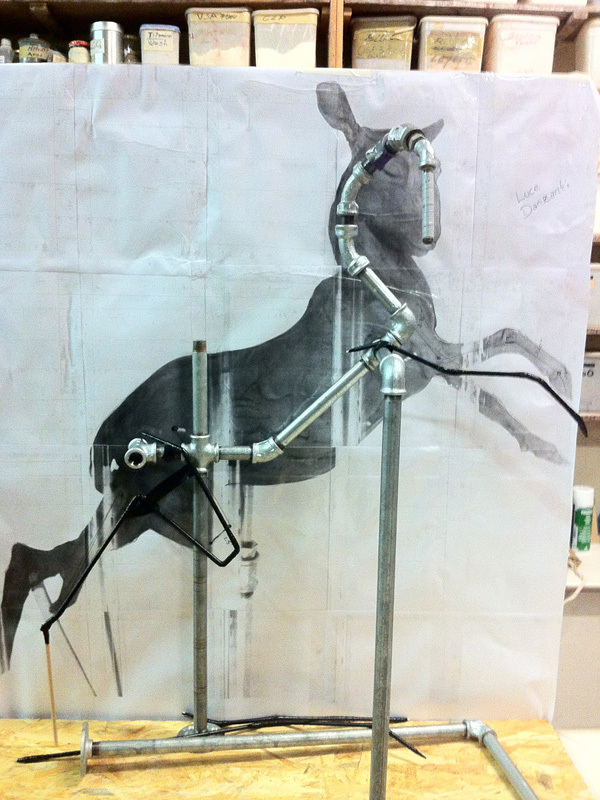 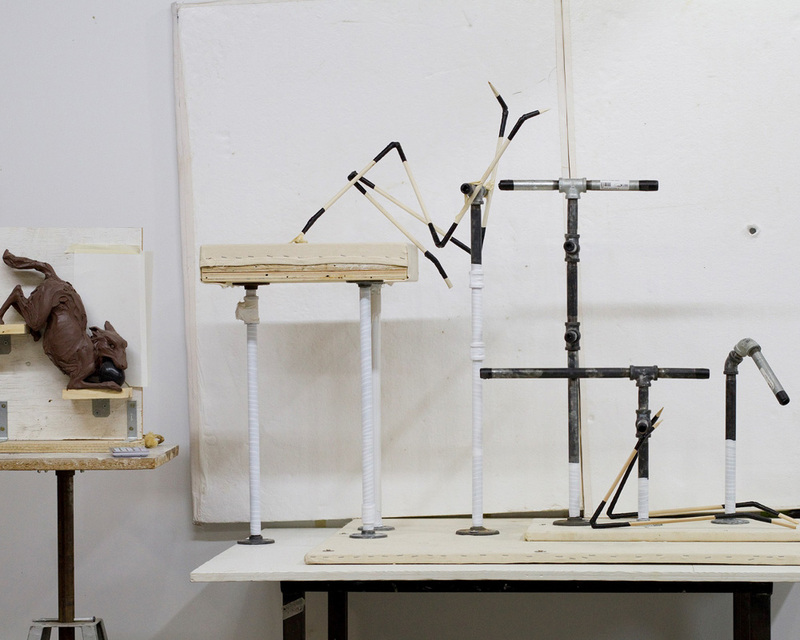 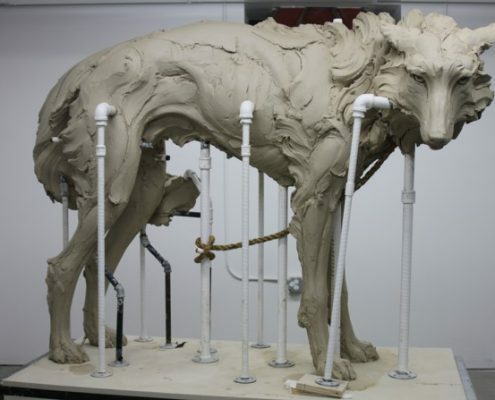 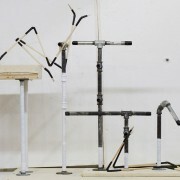 The armatures for the limbs (front and back legs) are made from a single wooden dowel, covered in electrical tape and bent at each joint. 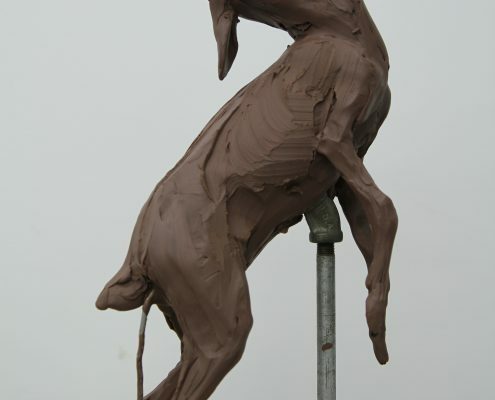 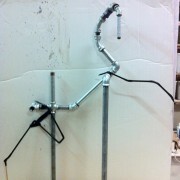 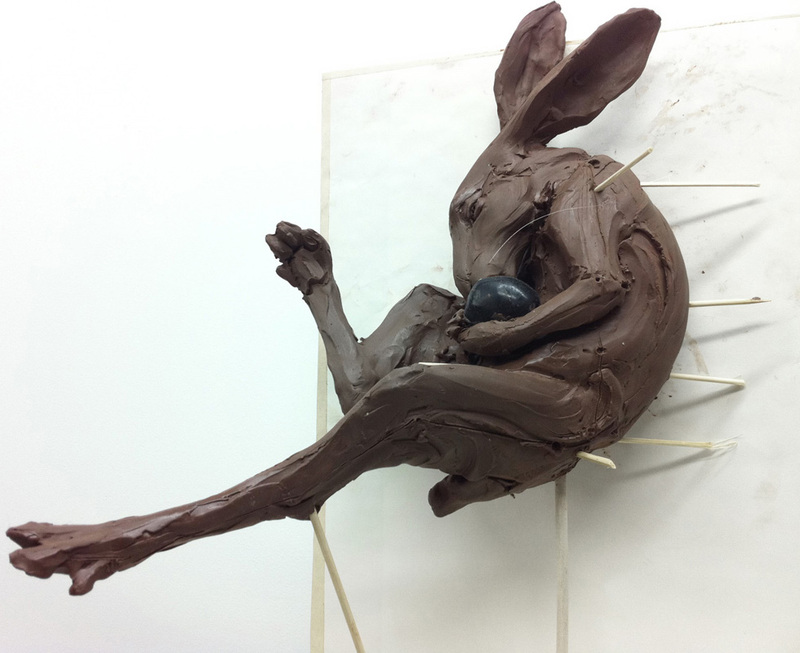 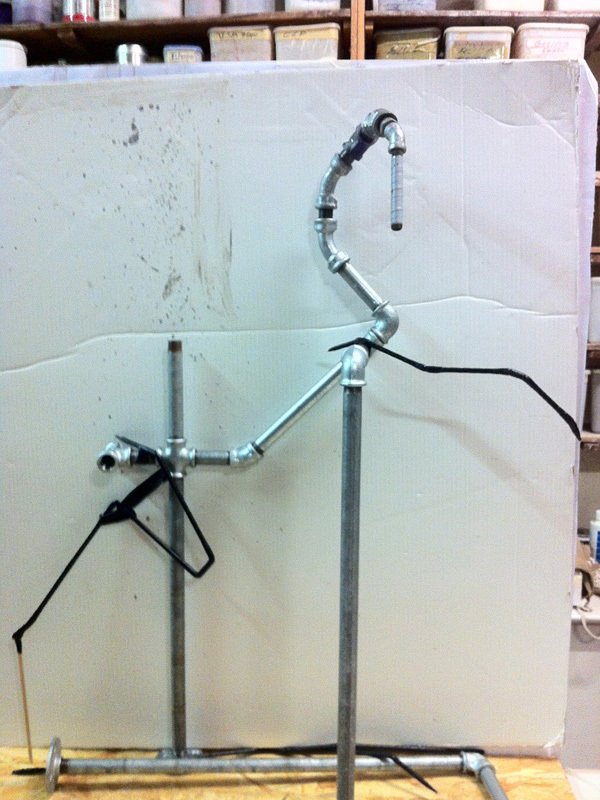 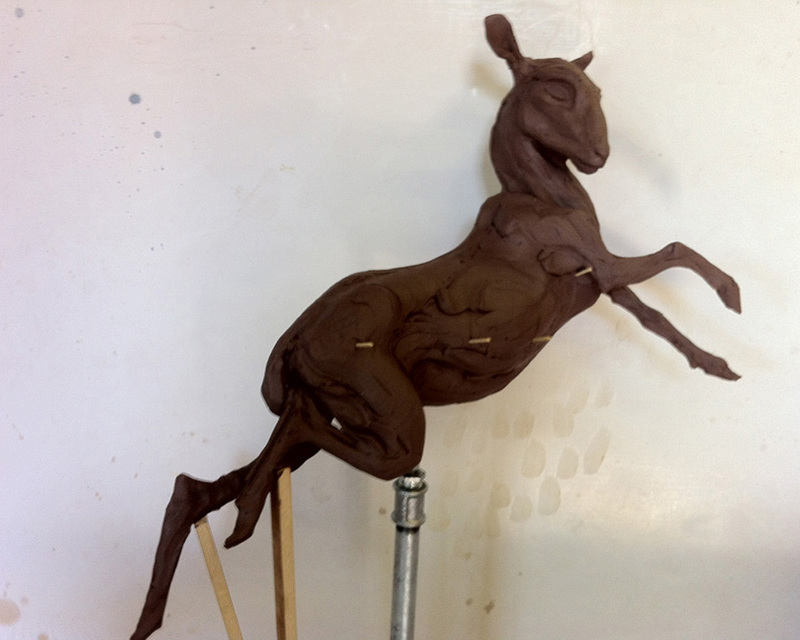 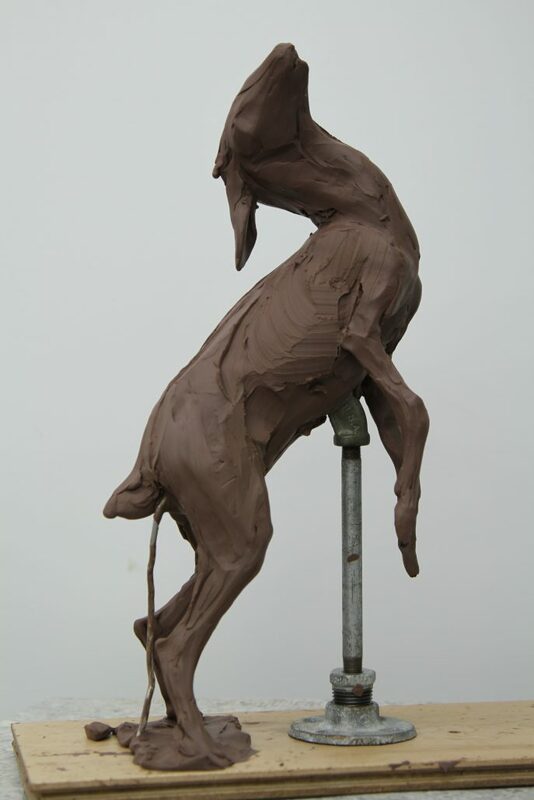 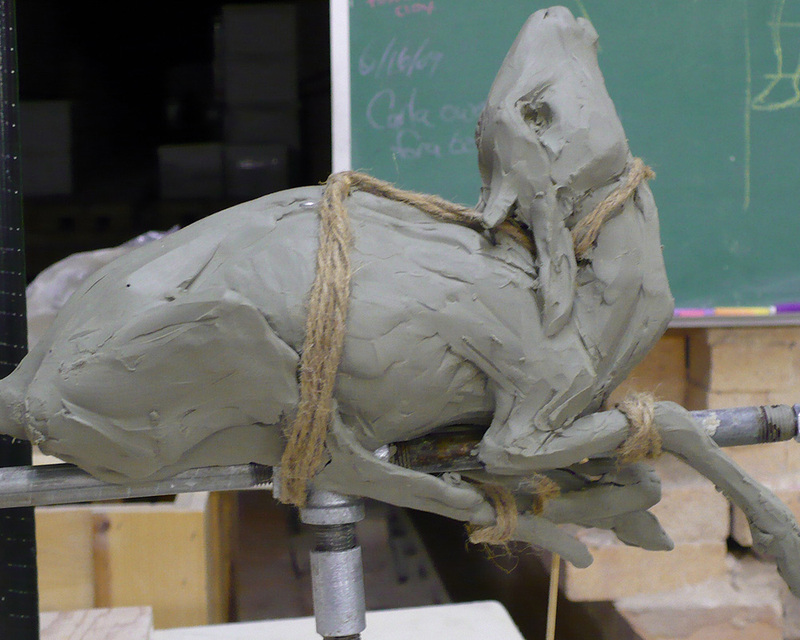 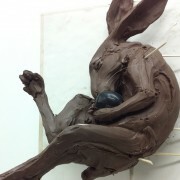 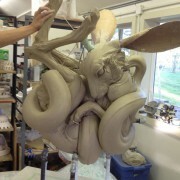 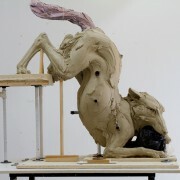 This simple armature is then covered in a clay coil and added to the body. 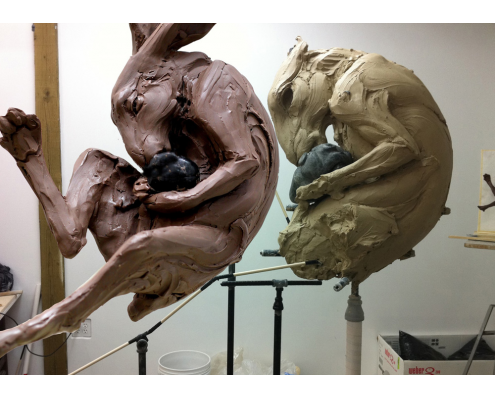 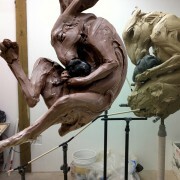 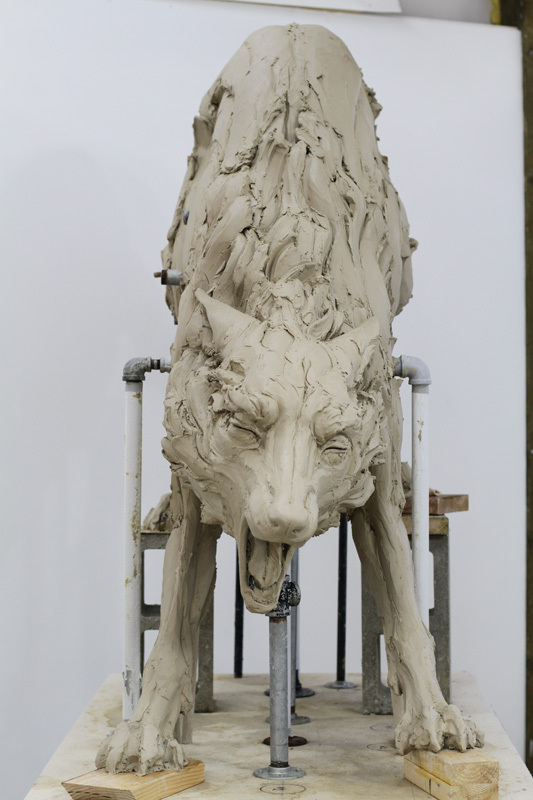 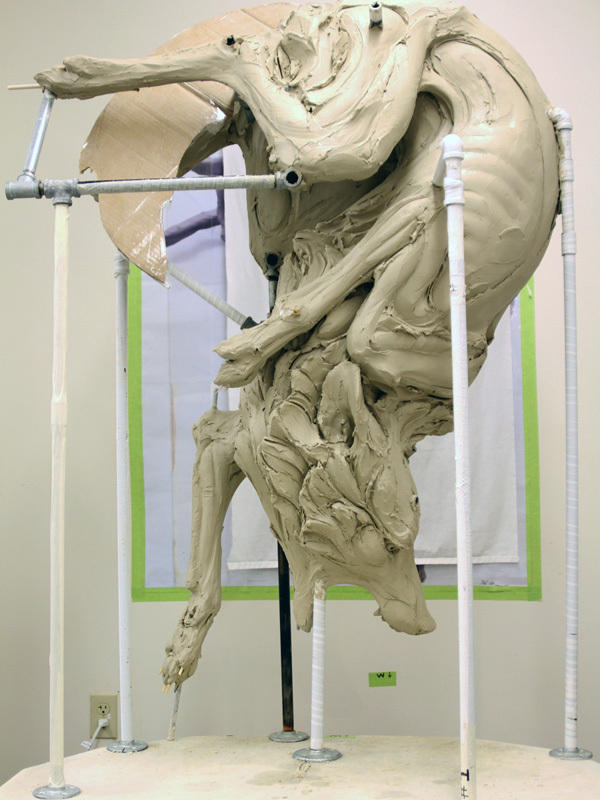 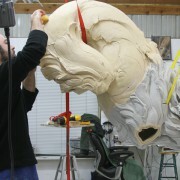 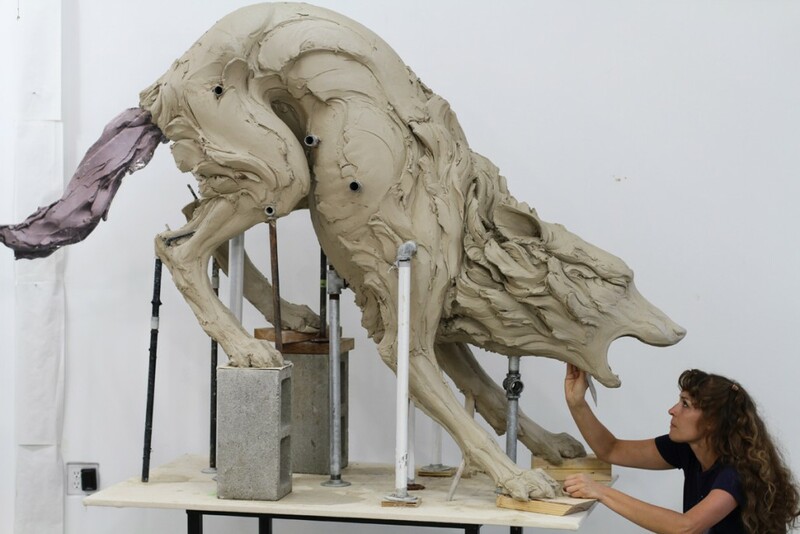 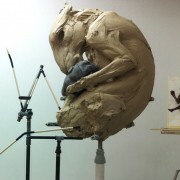 (for a more in-depth look at this process, visit the page on this site: “Making of a Rush of Blood to the Head”). 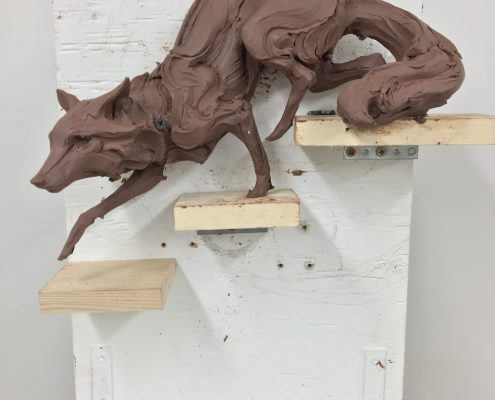 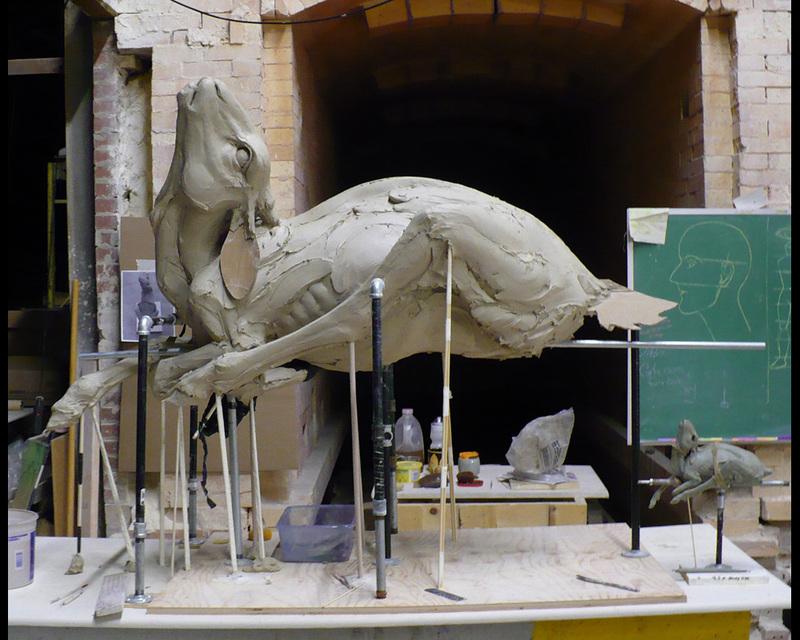 Below are a few examples of various maquettes and armatures for finished pieces you can find on the main portfolio page. 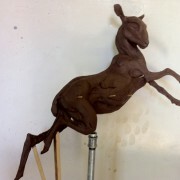 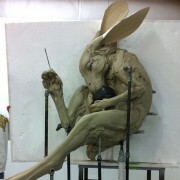 Starting with a maquette and building an armature. 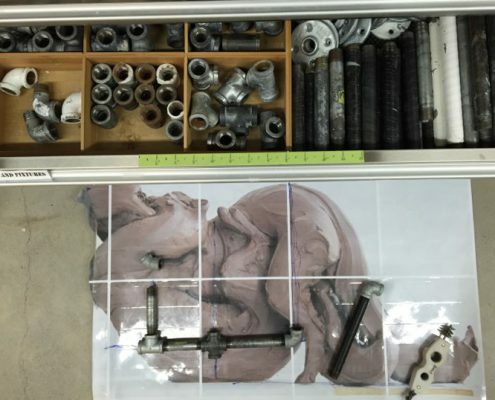 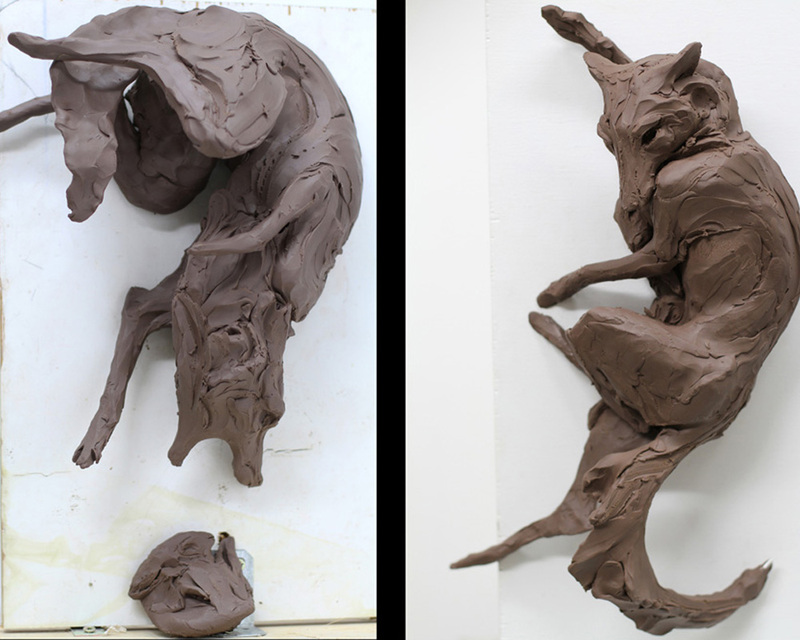 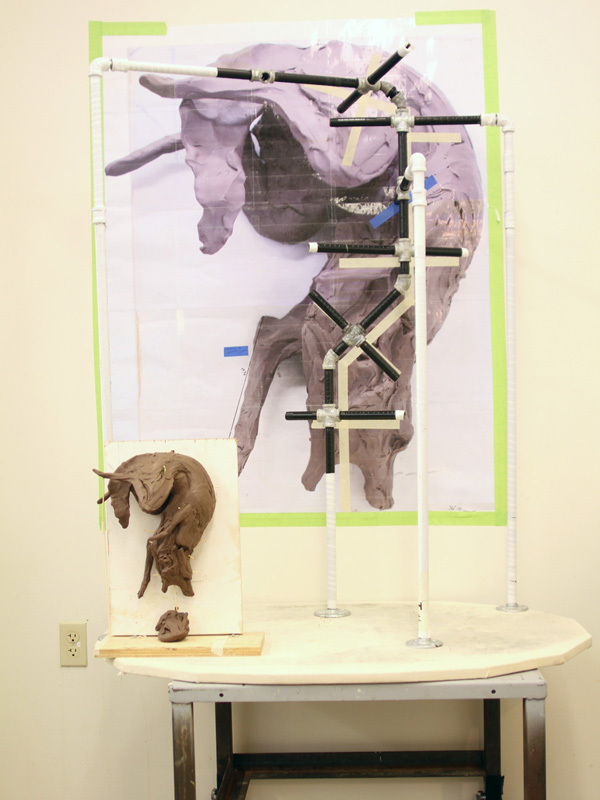 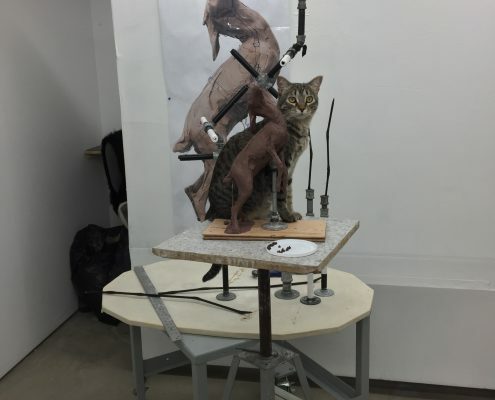 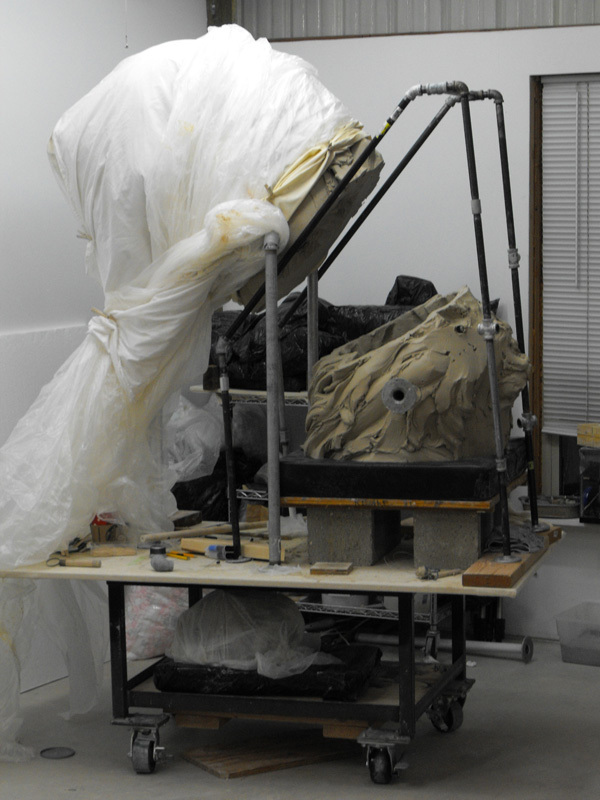 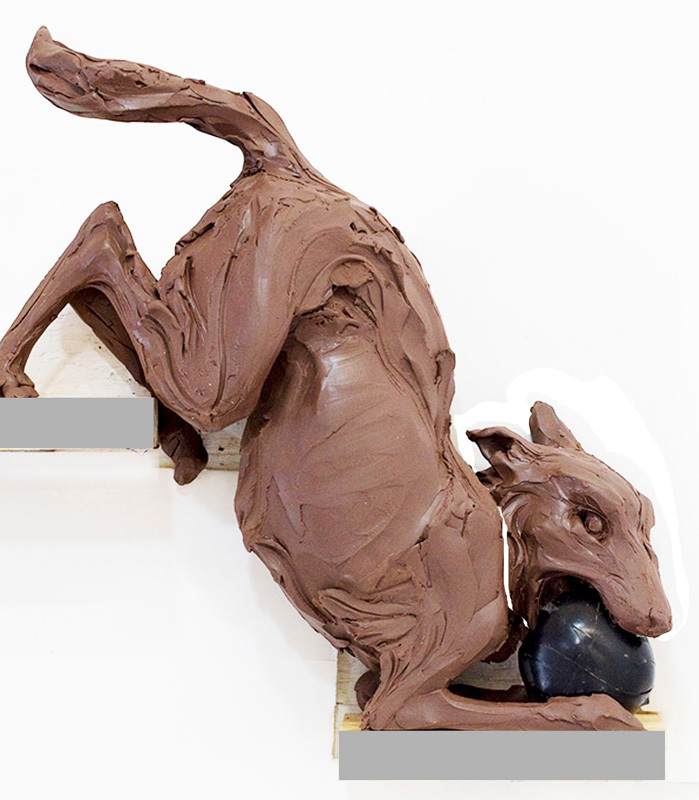 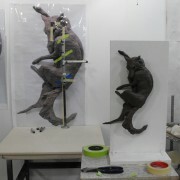 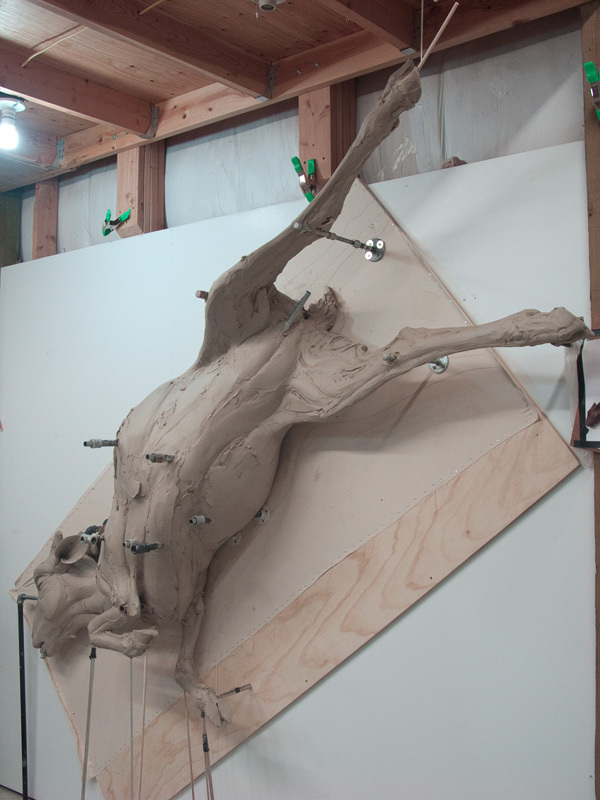 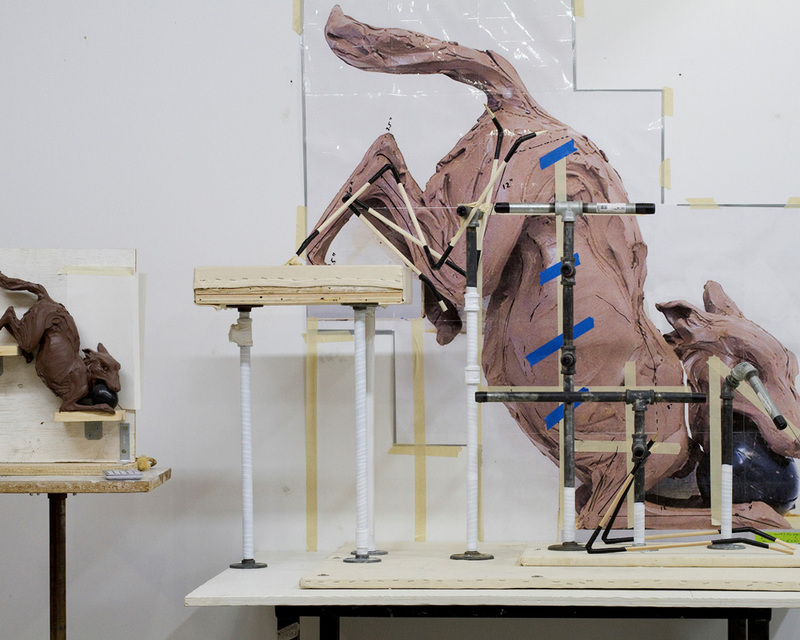 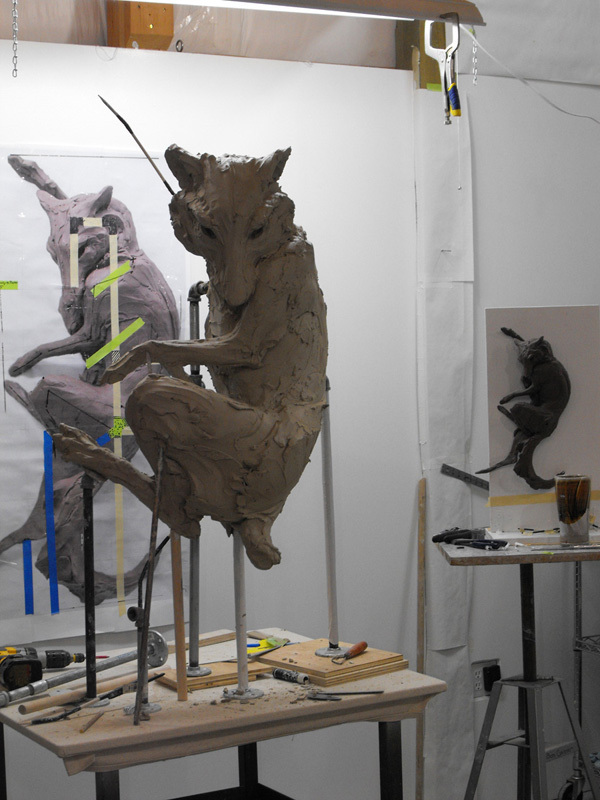 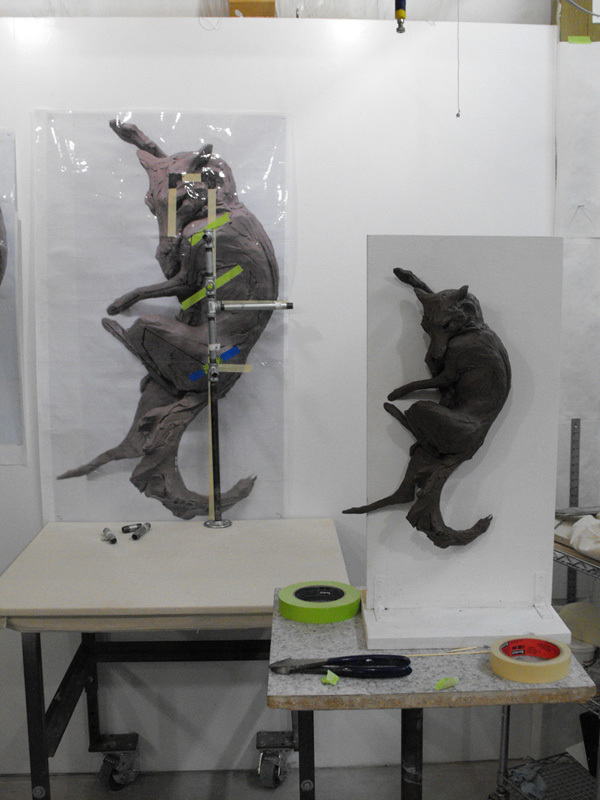 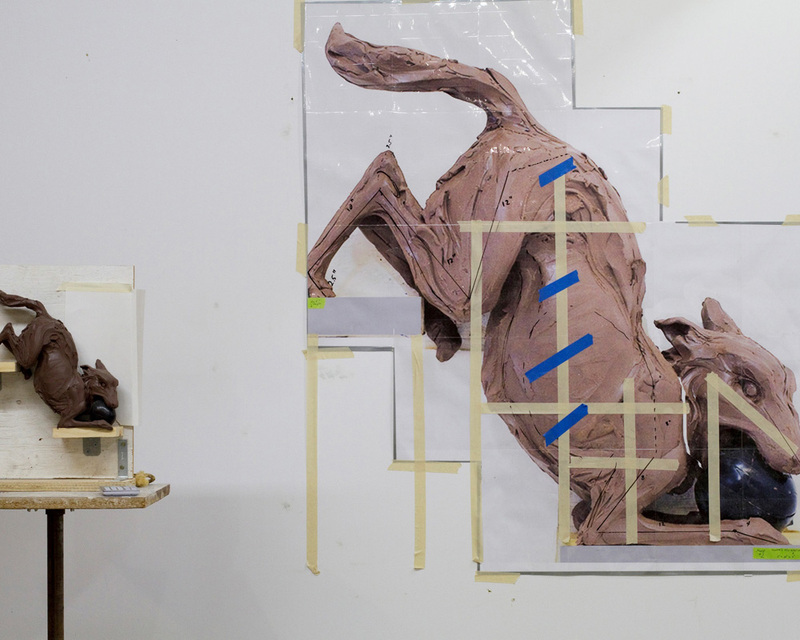 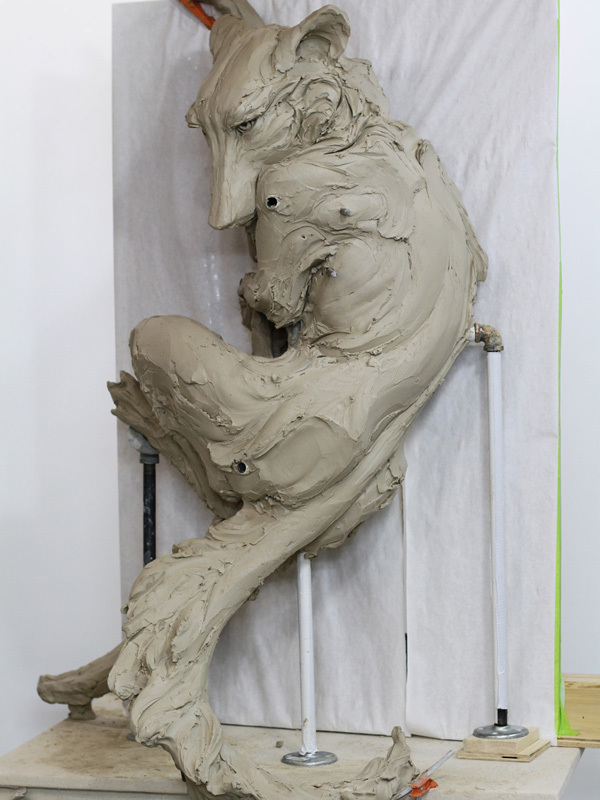 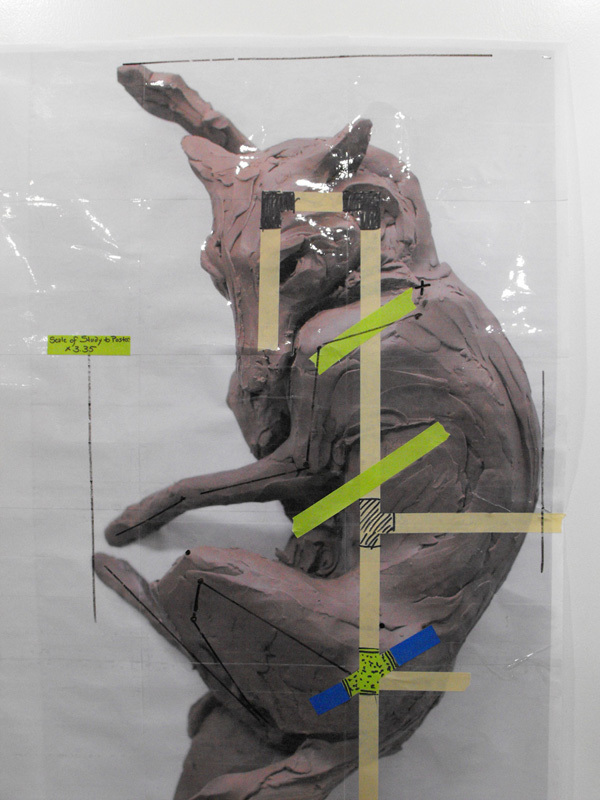 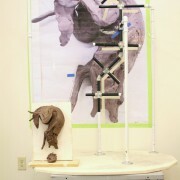 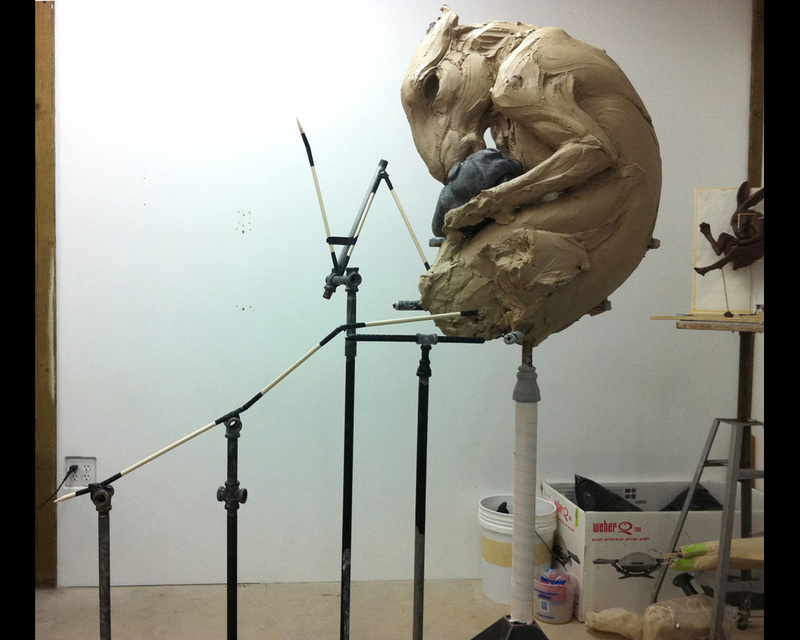 The current method I use to transfer a maquette into a larger sculpture is shown here with “The Choleric.” I use the maquettes as reference from start to finish – enlarging the image, making a print to scale, and building an armature in front of the block poster. 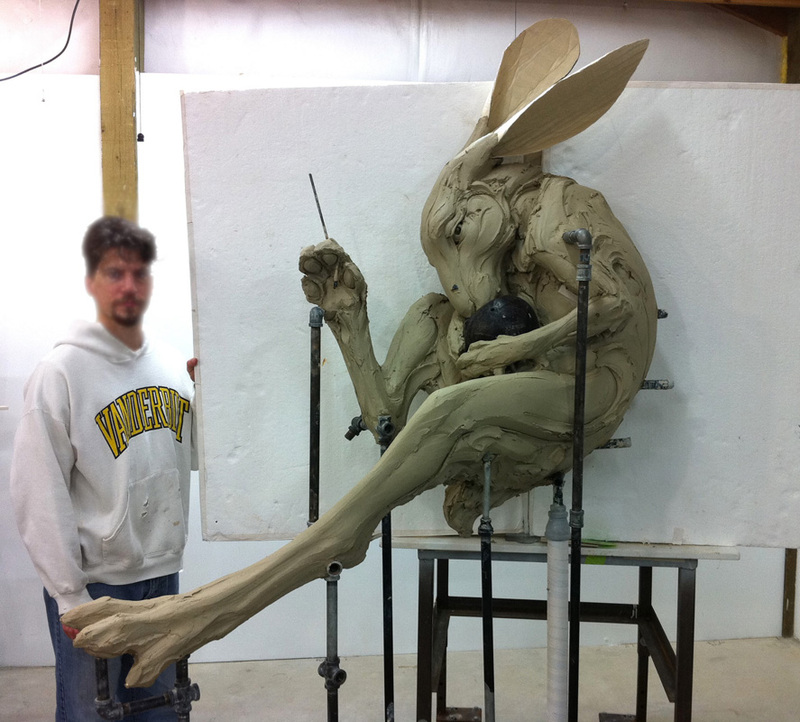 The gesture is roughed in from the original sketch and adjusted for the scale of the piece. 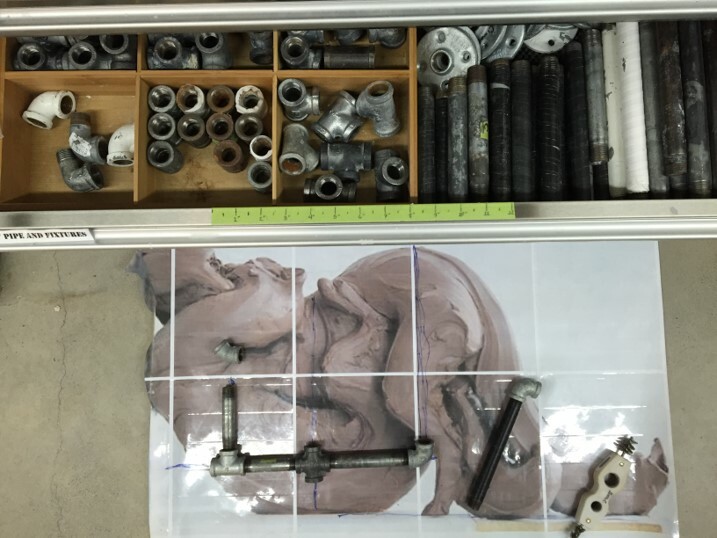 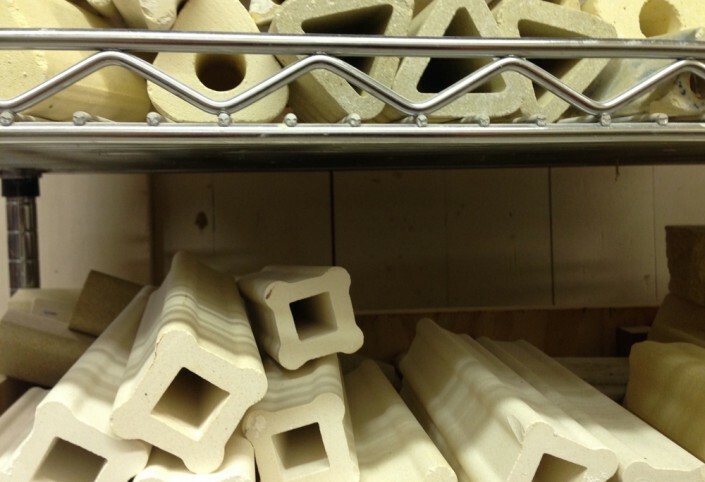 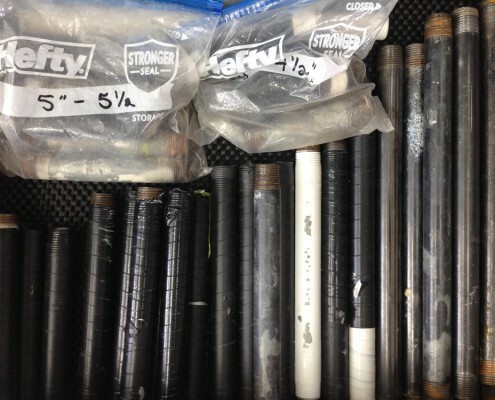 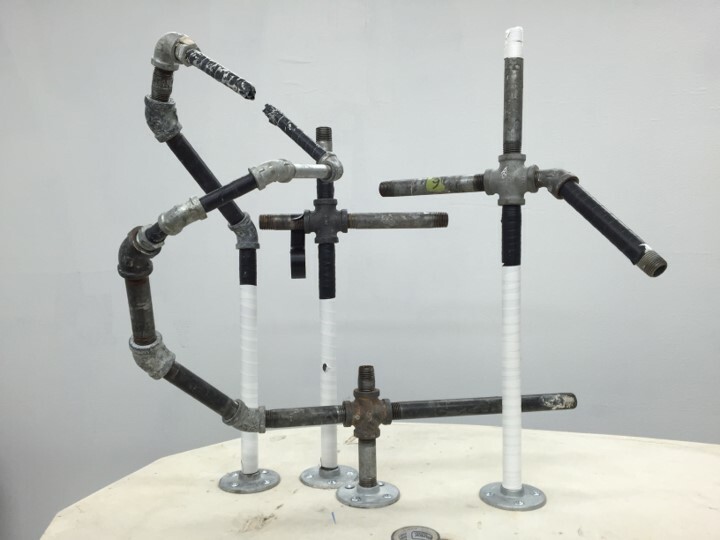 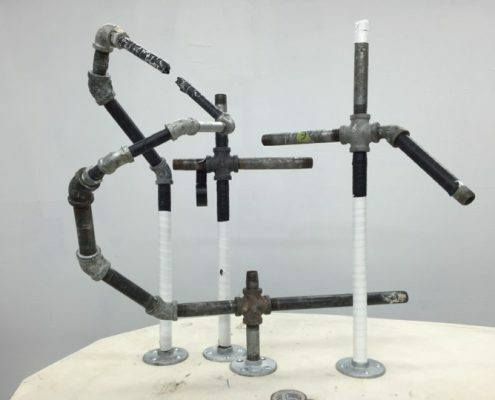 I work with various tools when I begin building: dowels and pipes are versatile enough to create a variety of support structures, while large prints and Photoshop help me envision the finished sculpture while I work. 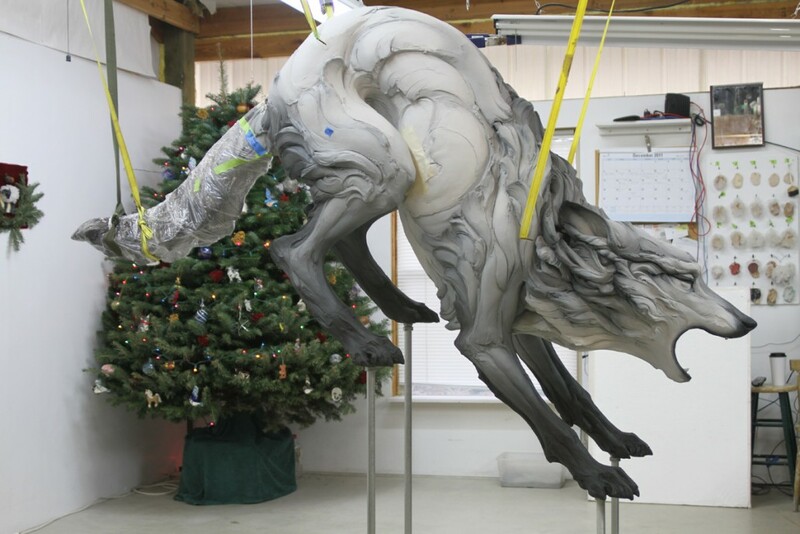 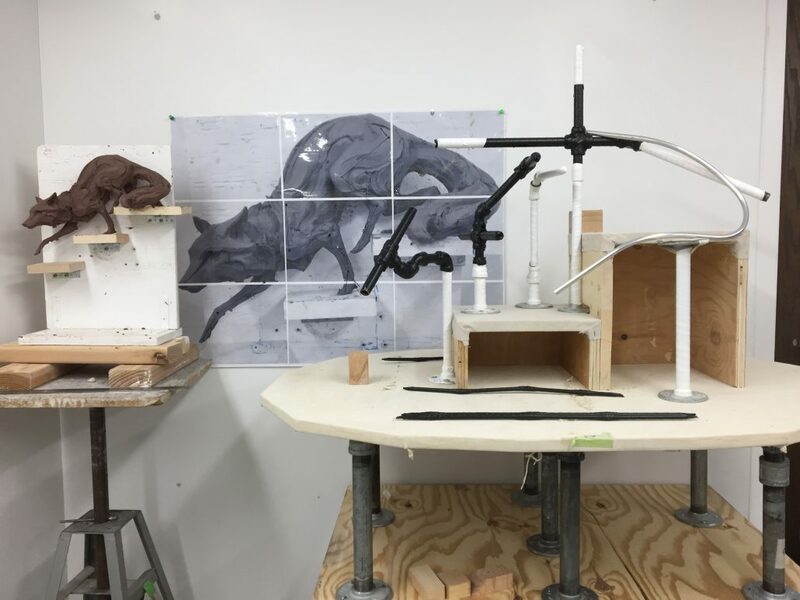 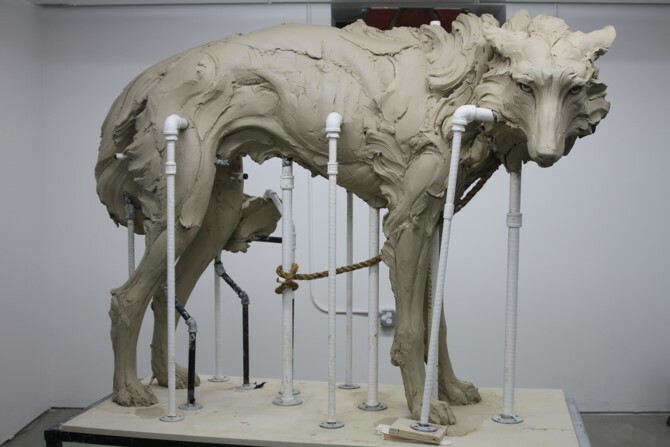 Due to the scale of this final sculpture I had to devise a new way to design an armature that would support the weight of the 2,400 lb solid form. 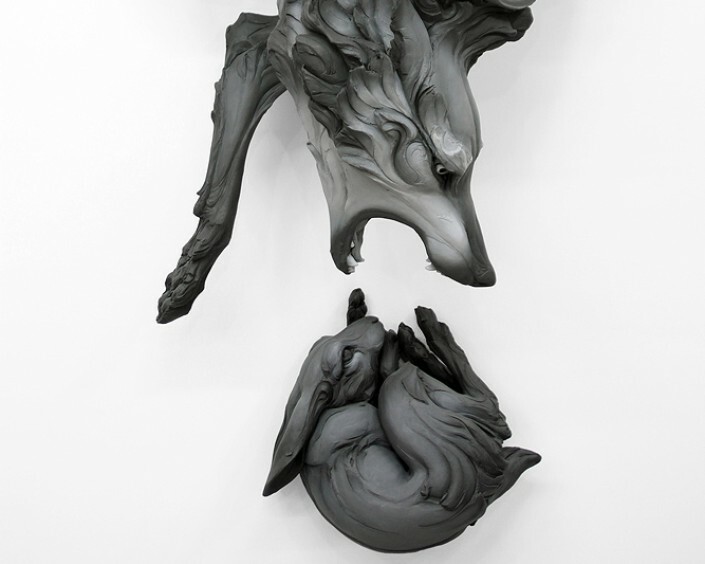 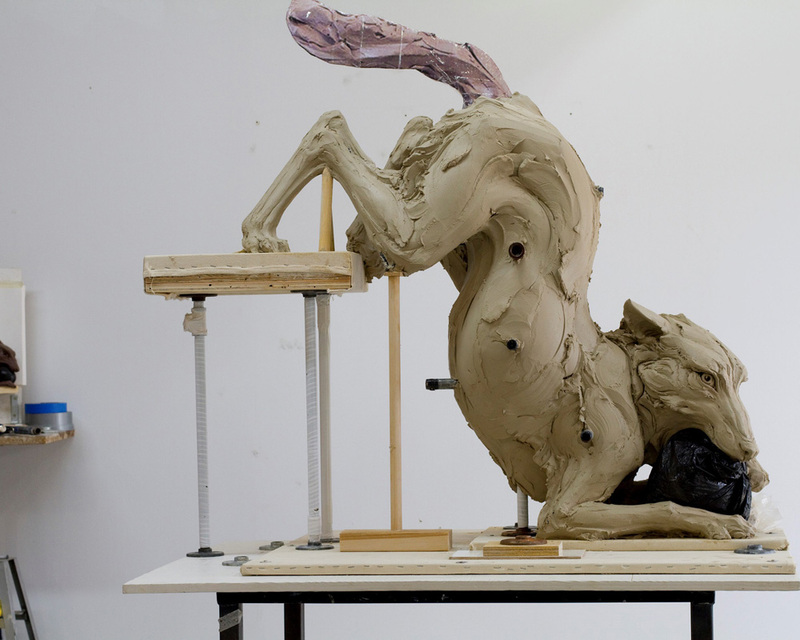 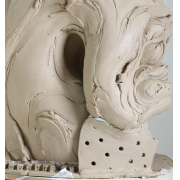 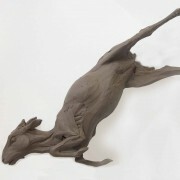 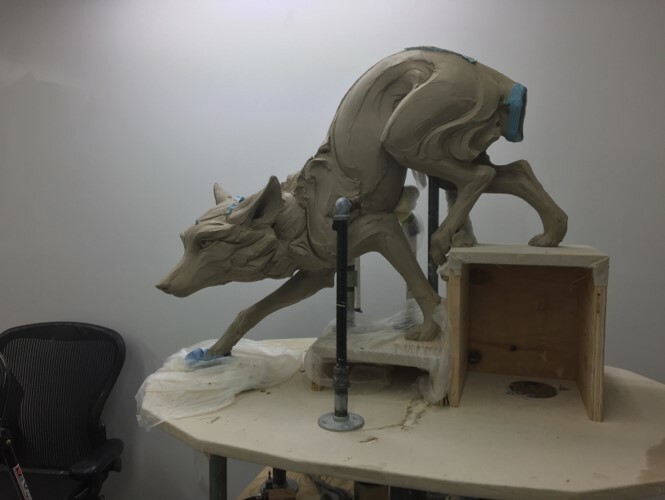 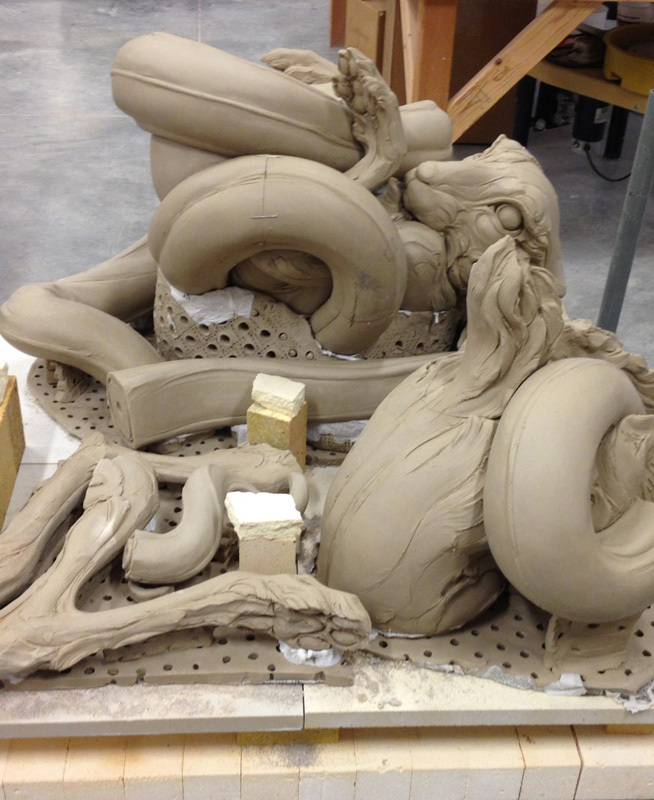 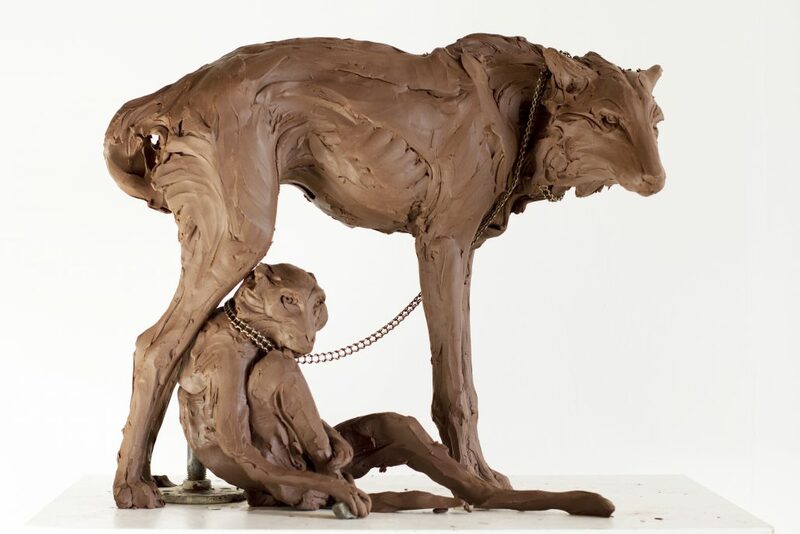 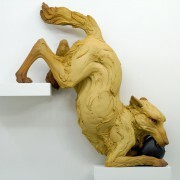 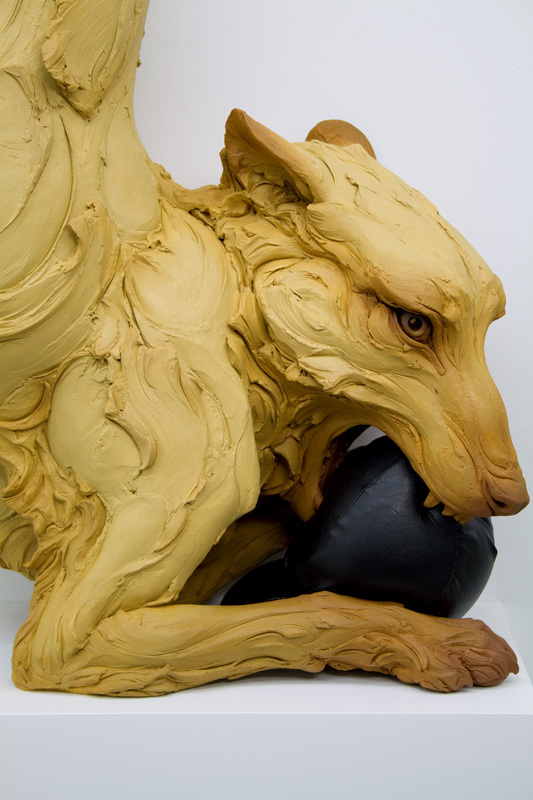 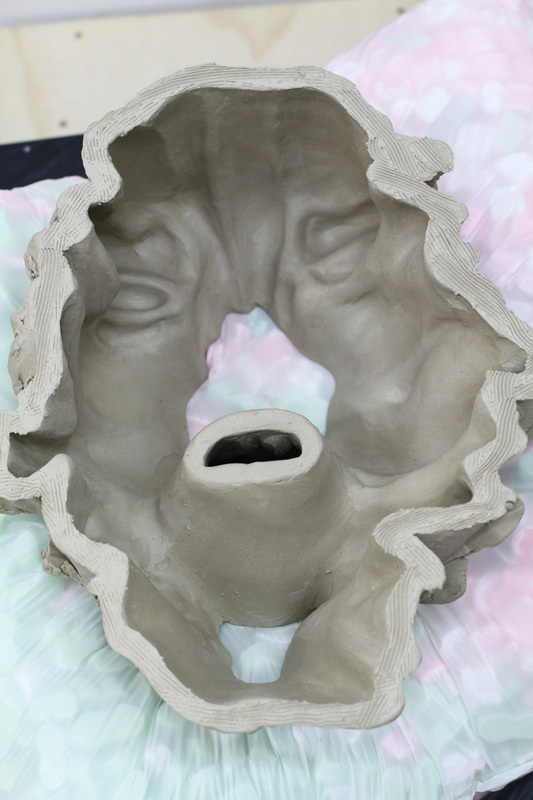 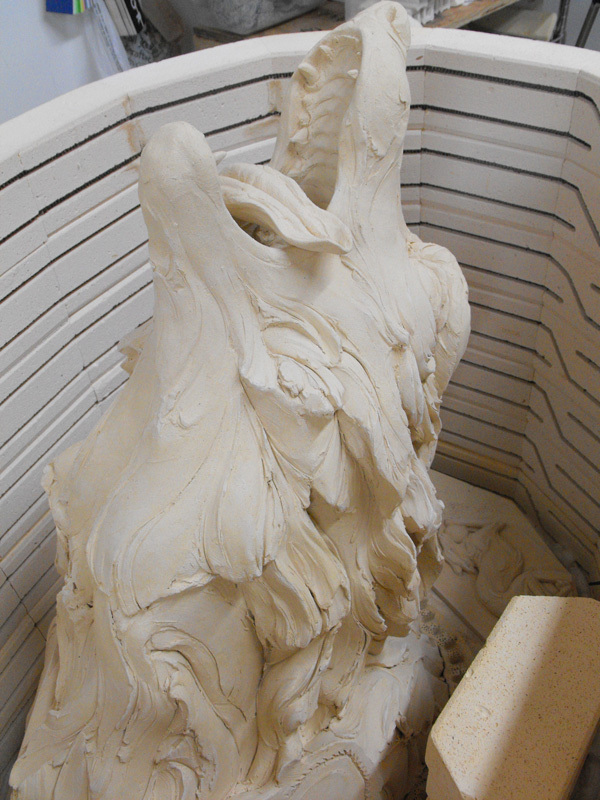 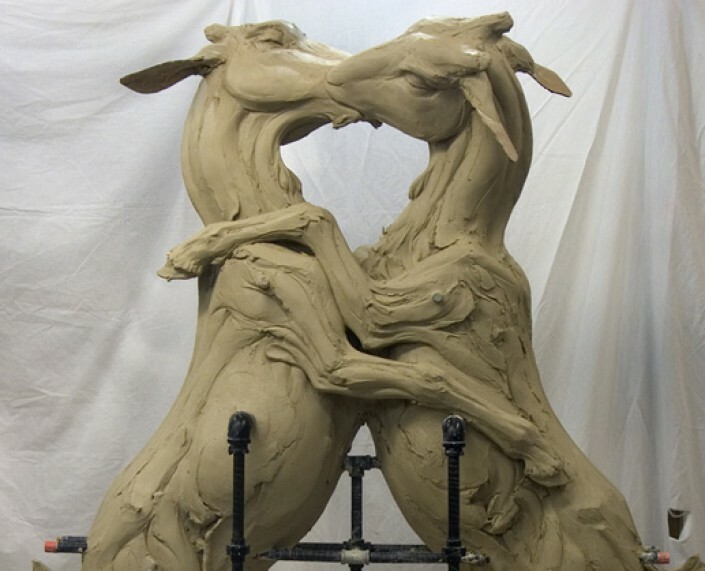 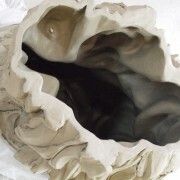 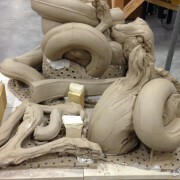 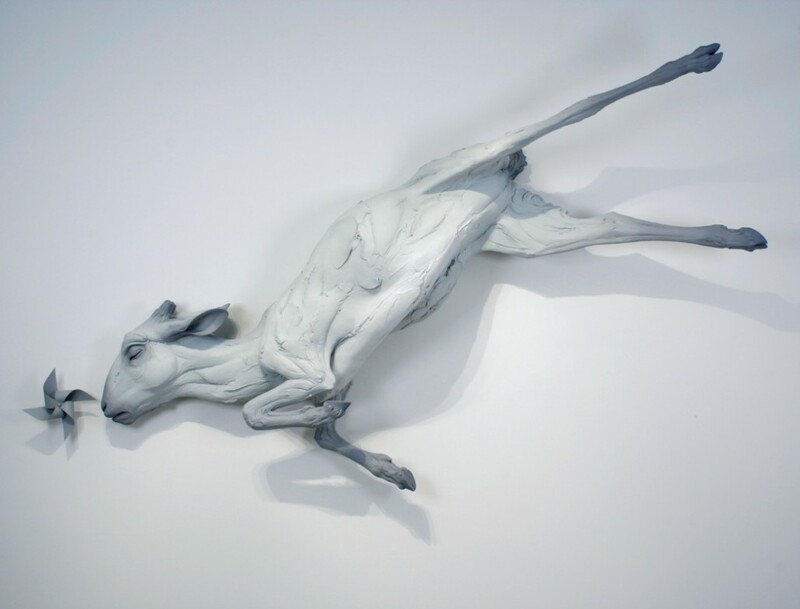 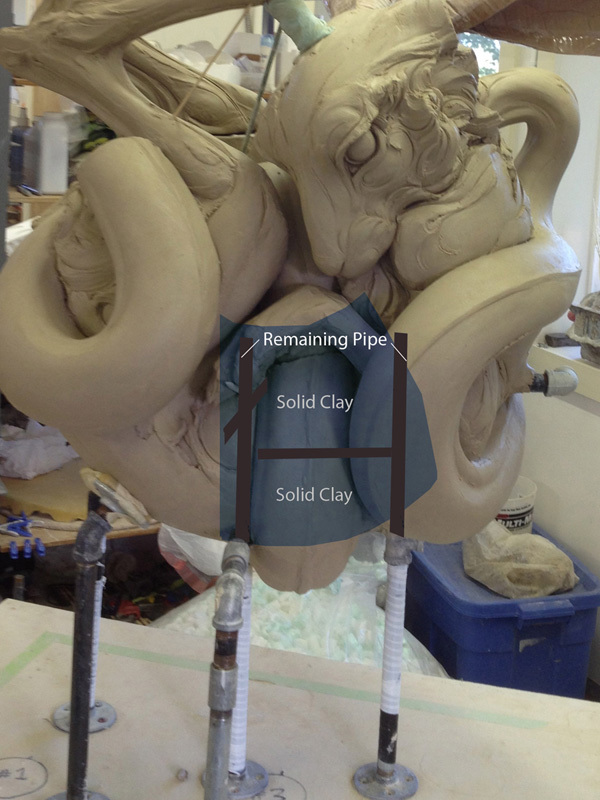 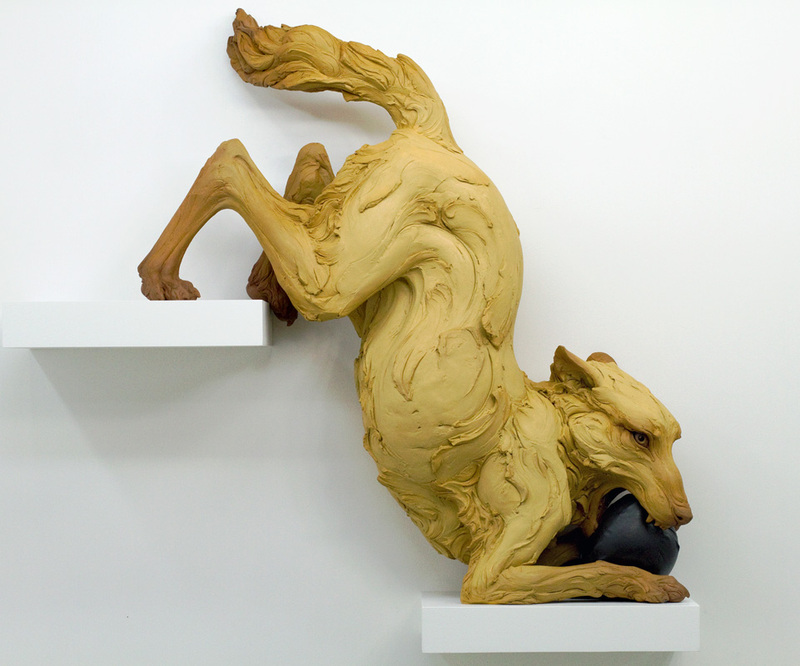 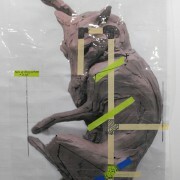 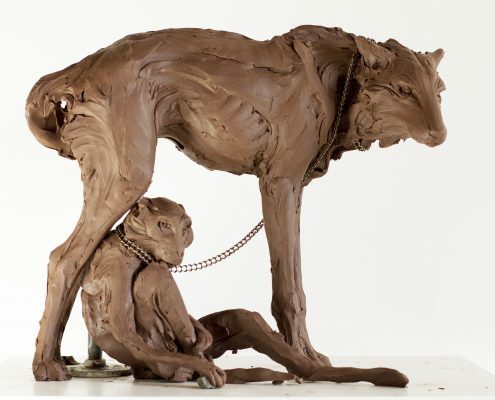 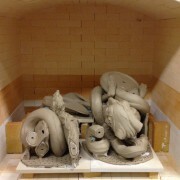 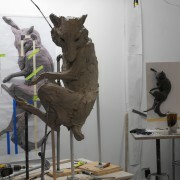 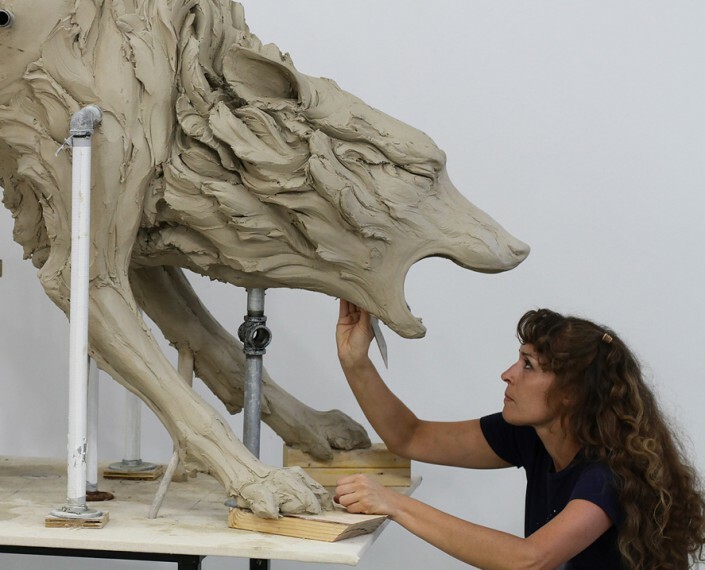 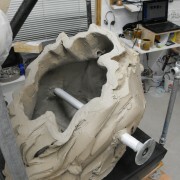 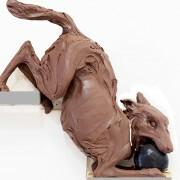 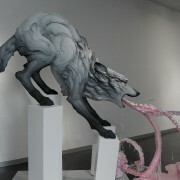 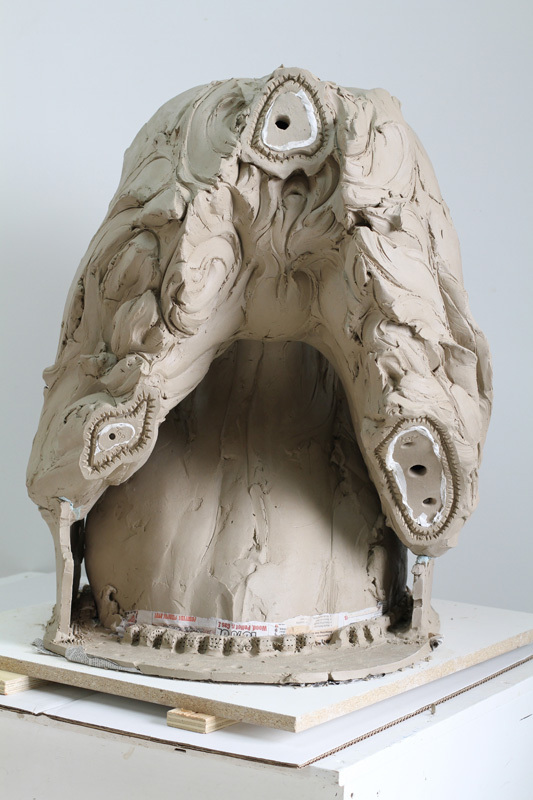 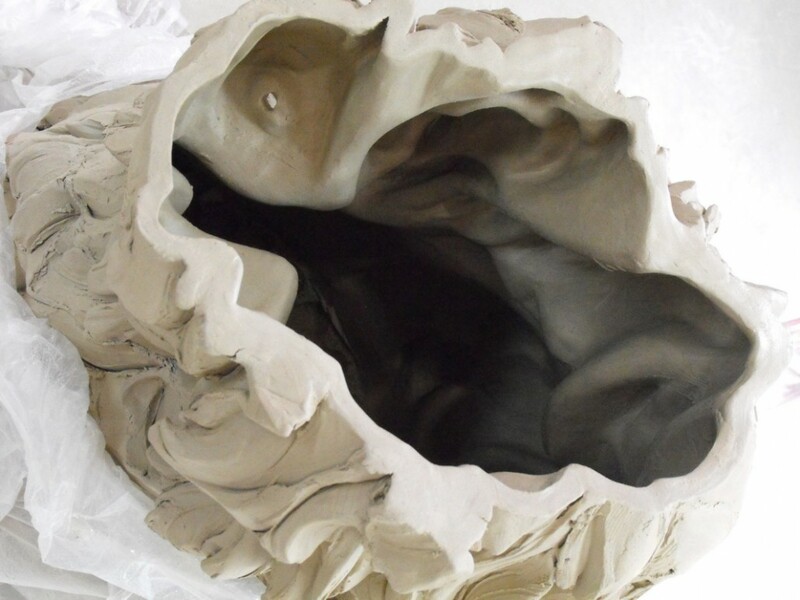 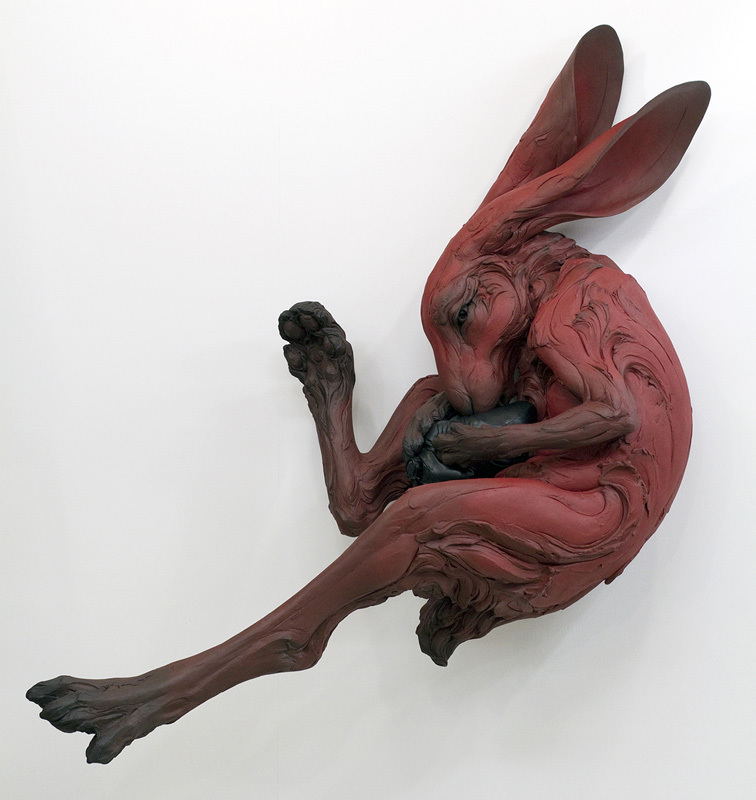 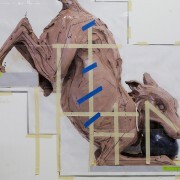 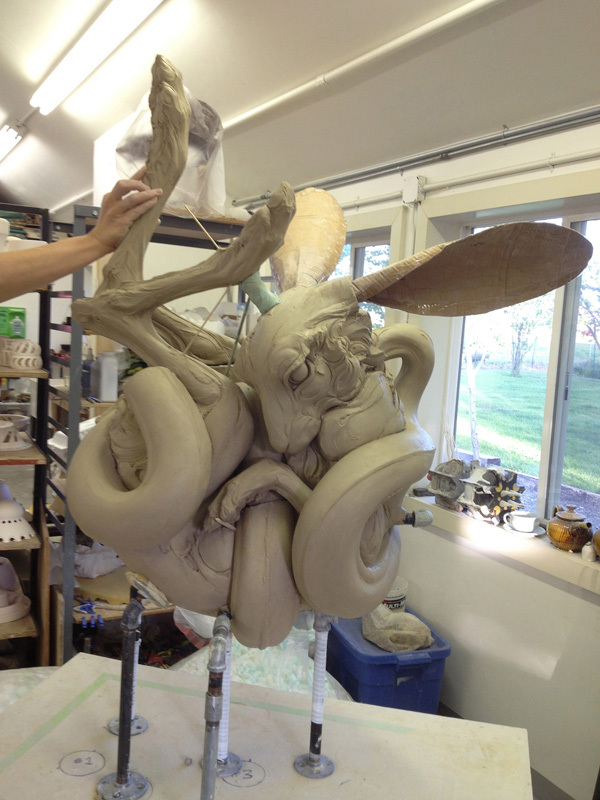 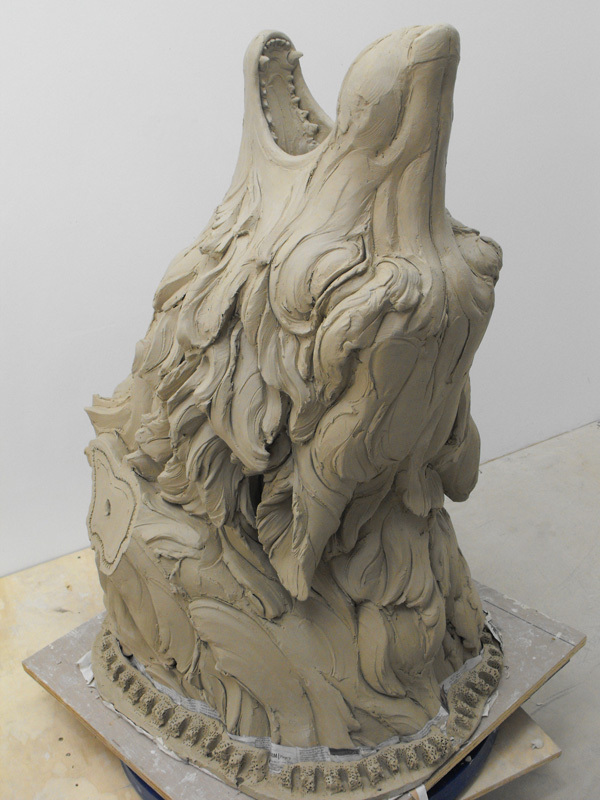 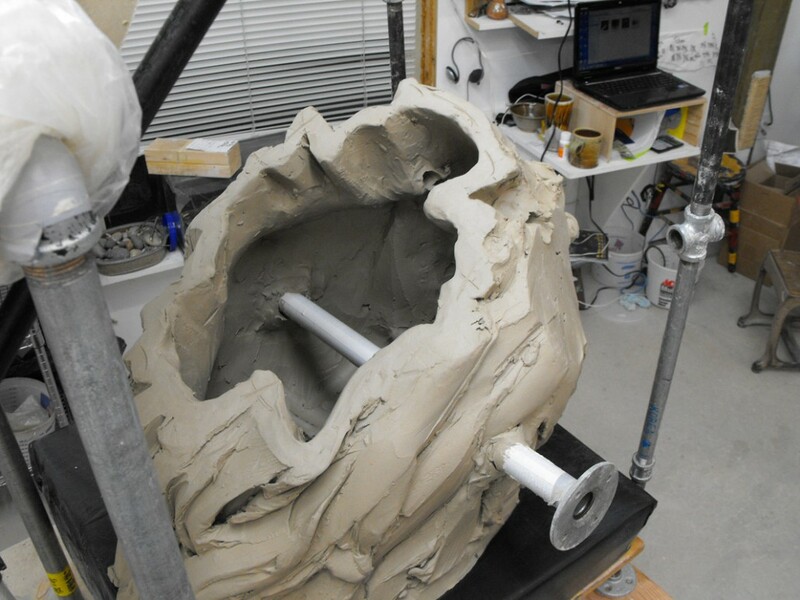 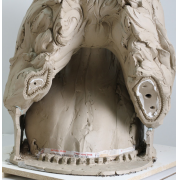 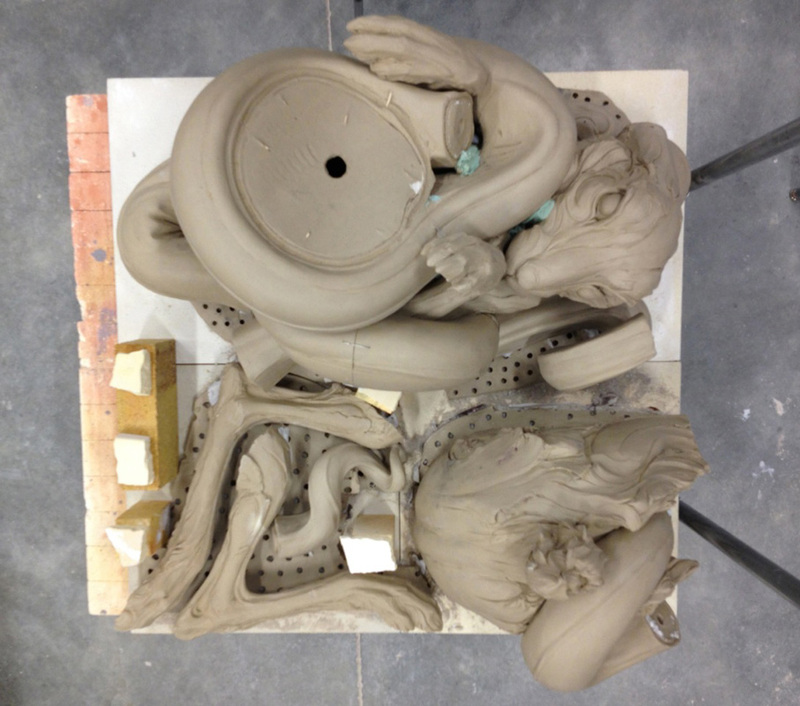 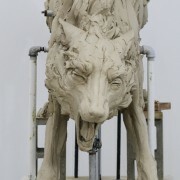 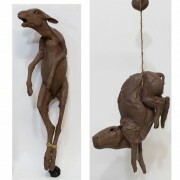 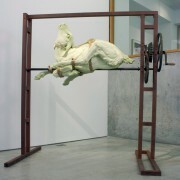 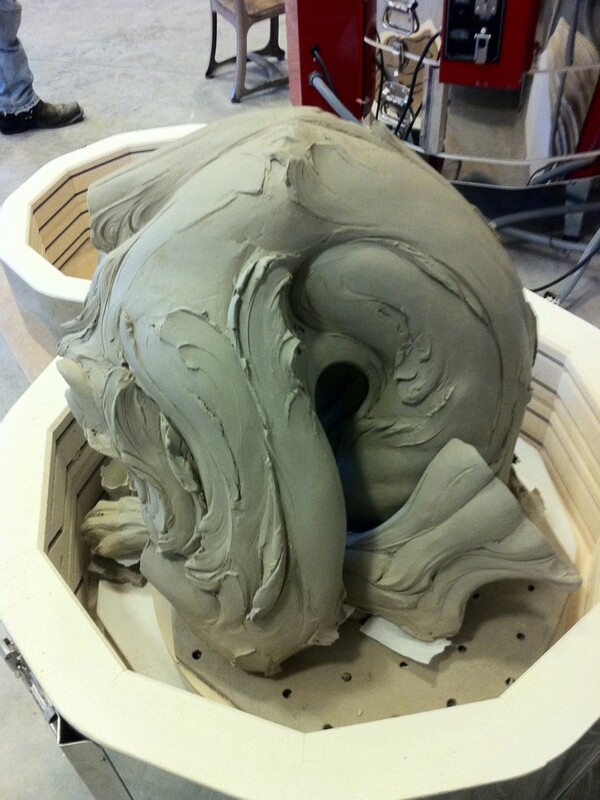 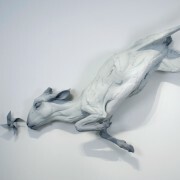 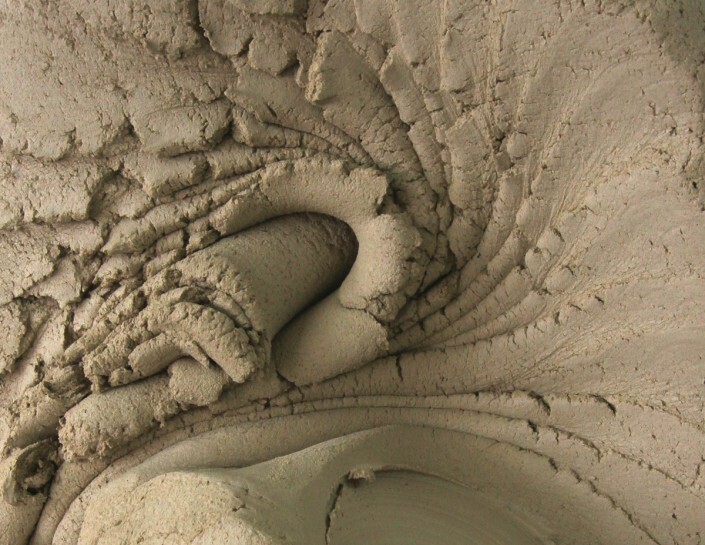 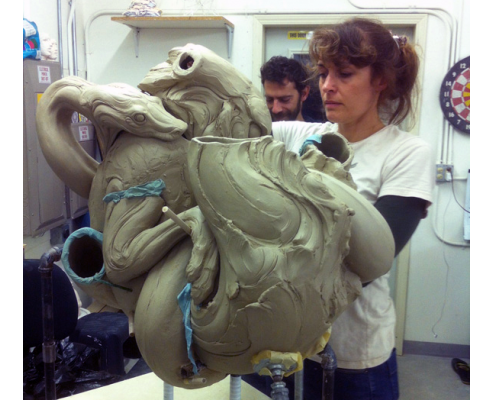 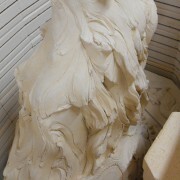 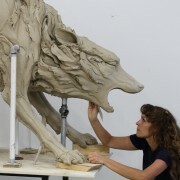 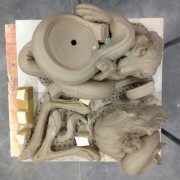 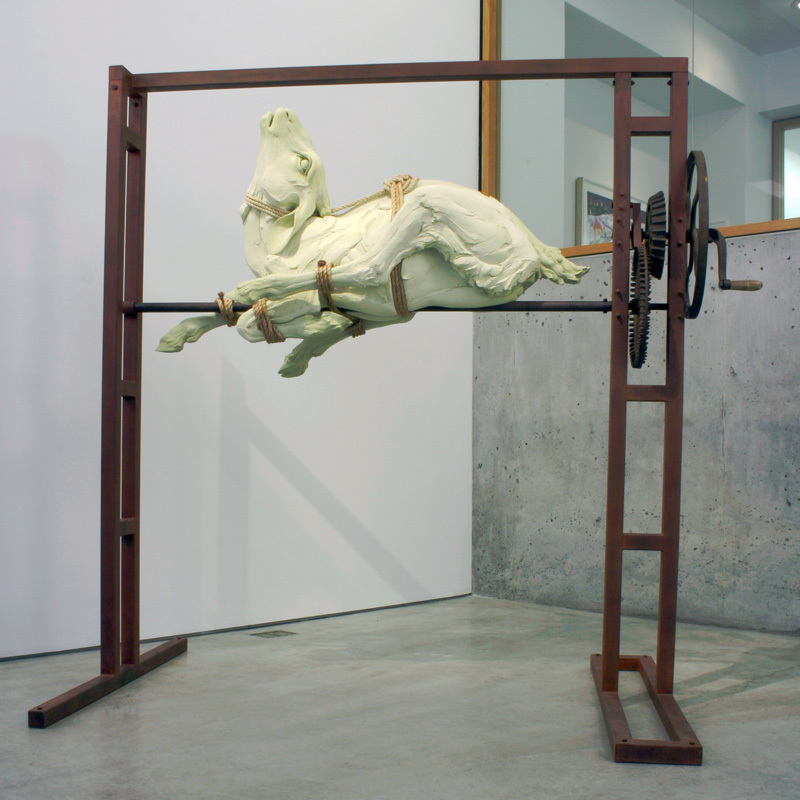 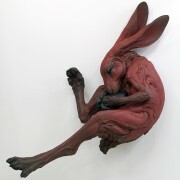 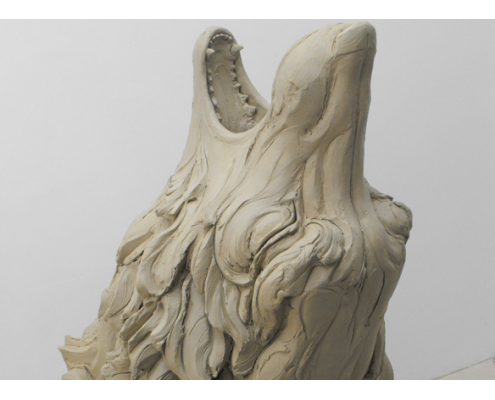 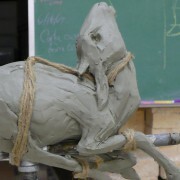 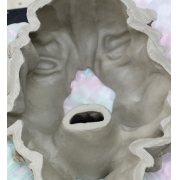 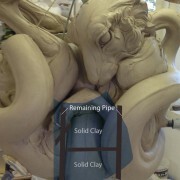 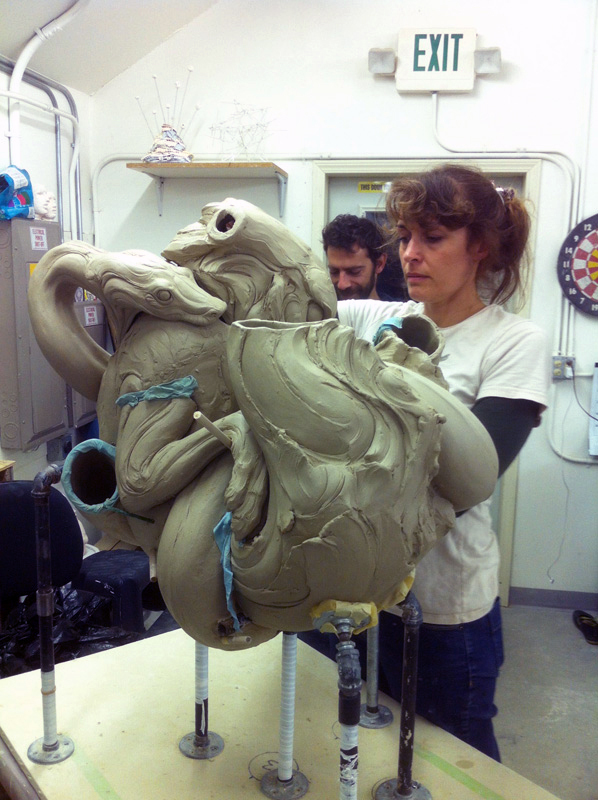 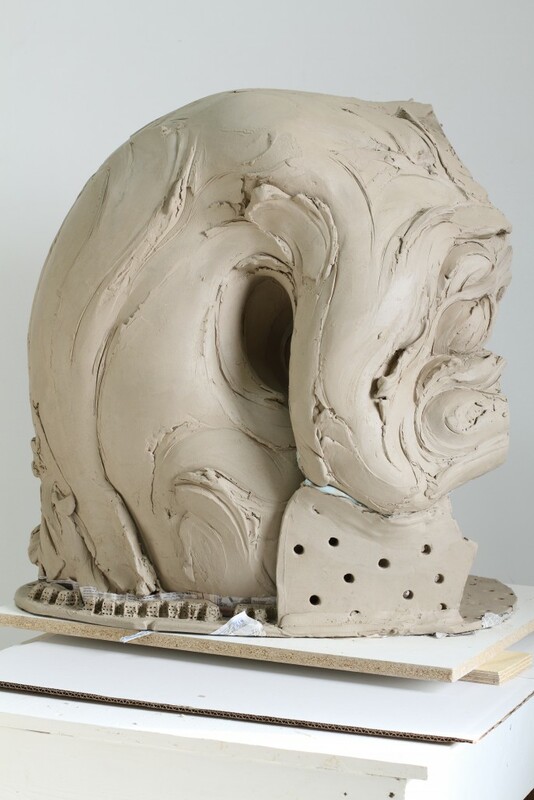 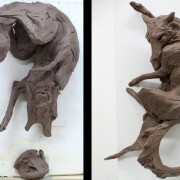 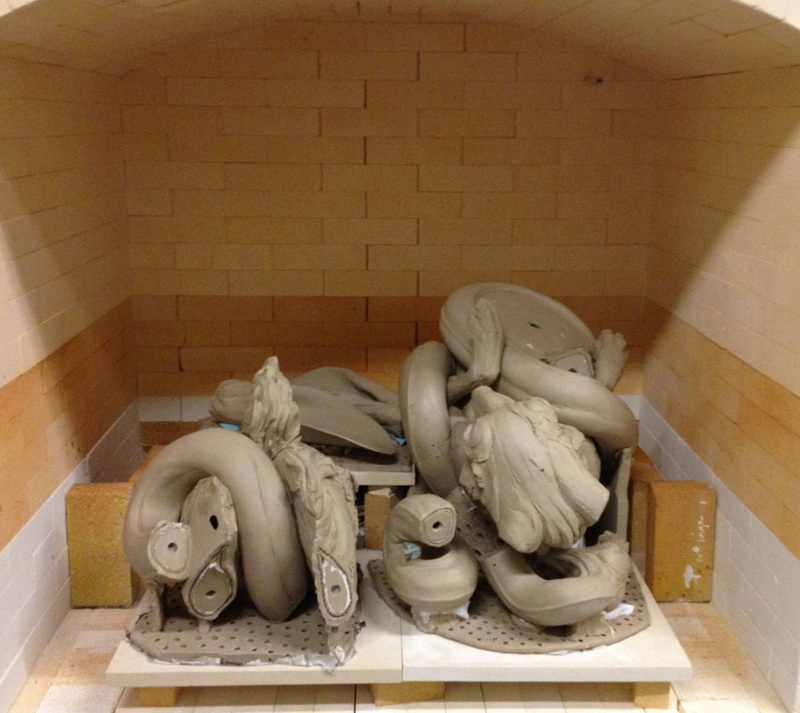 These images illustrate the unique challenges of keeping the sculpture supported while sculpting, cutting, hollowing, and firing the piece. 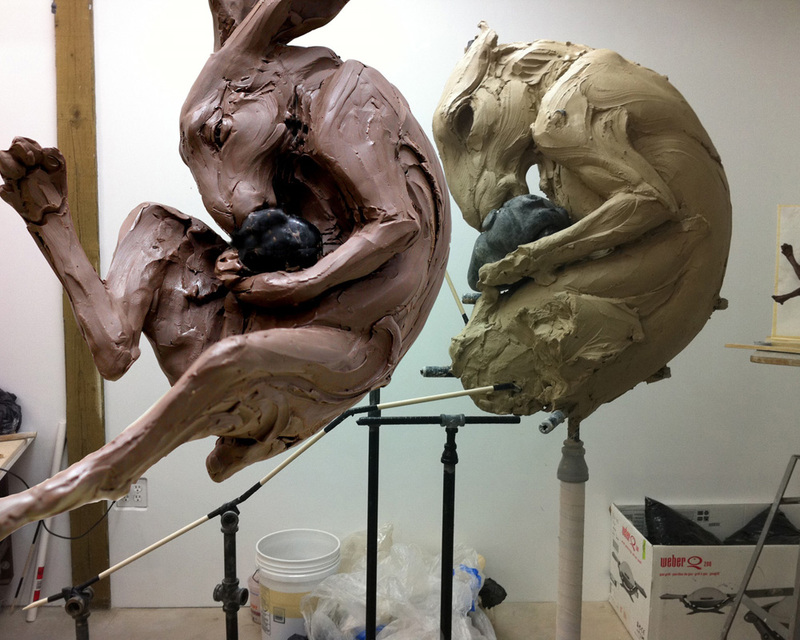 The immense complexity of the two figures intertwining in this sculpture demanded an alternative way of reassembling while hollow. 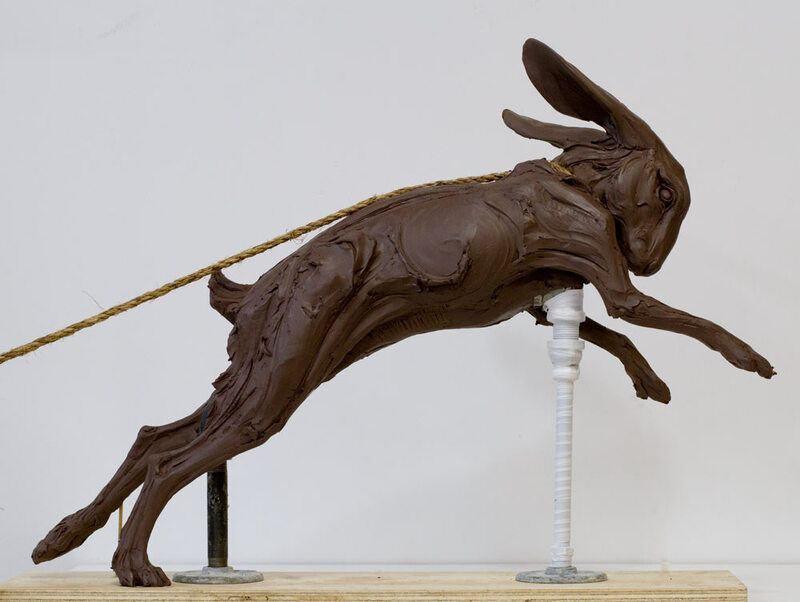 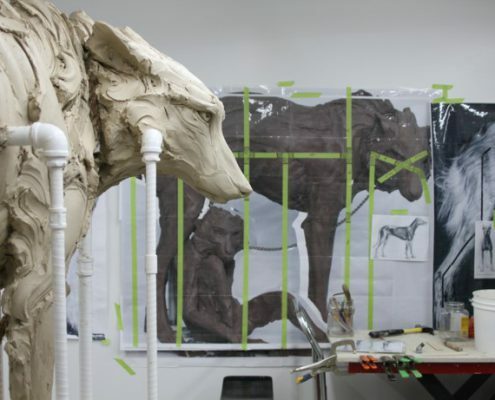 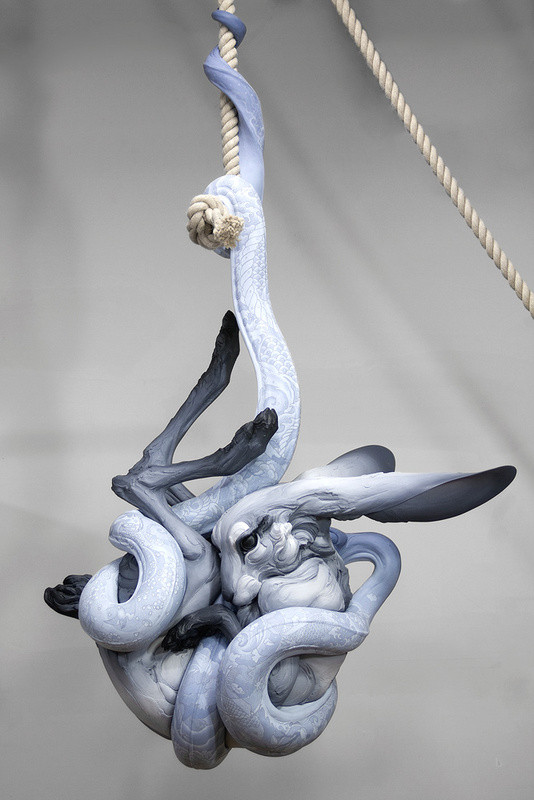 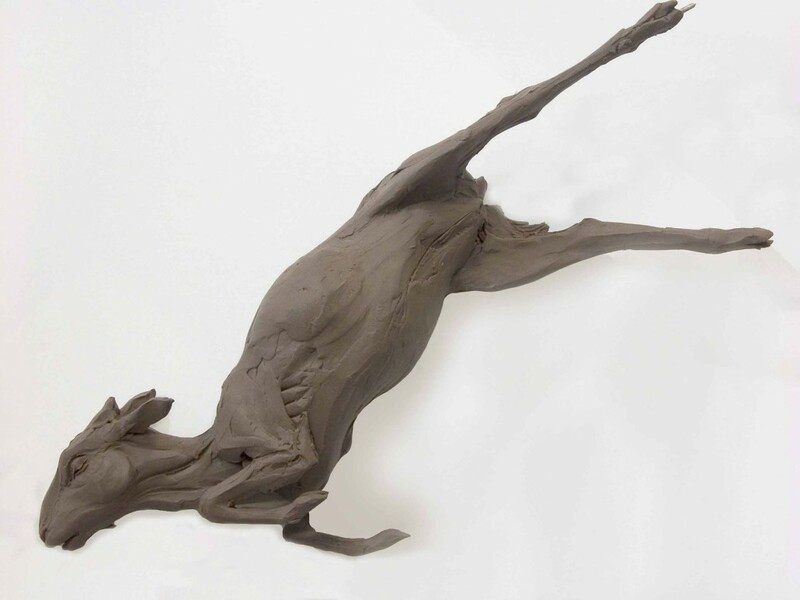 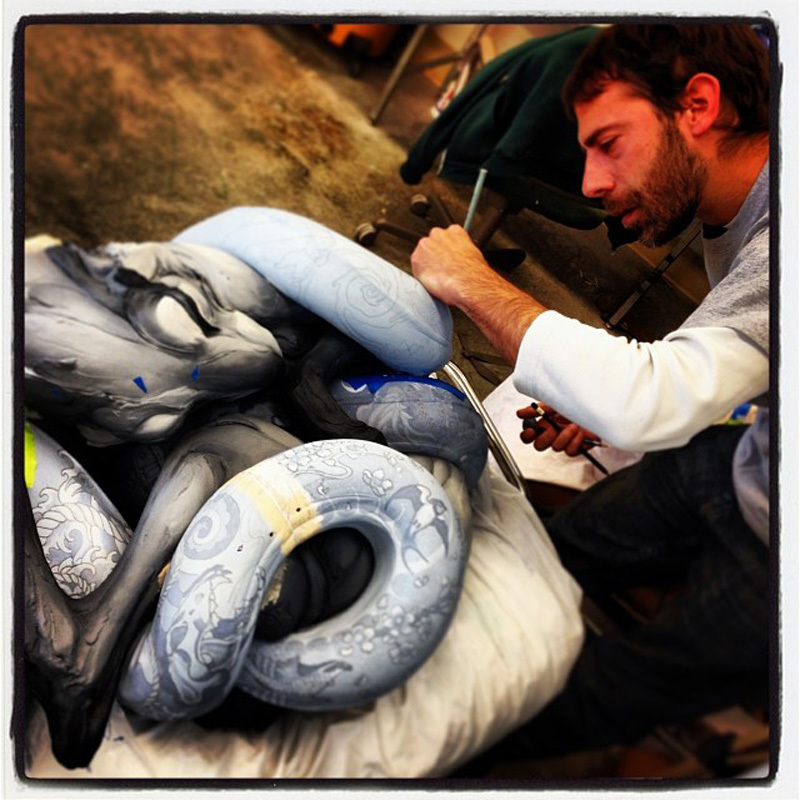 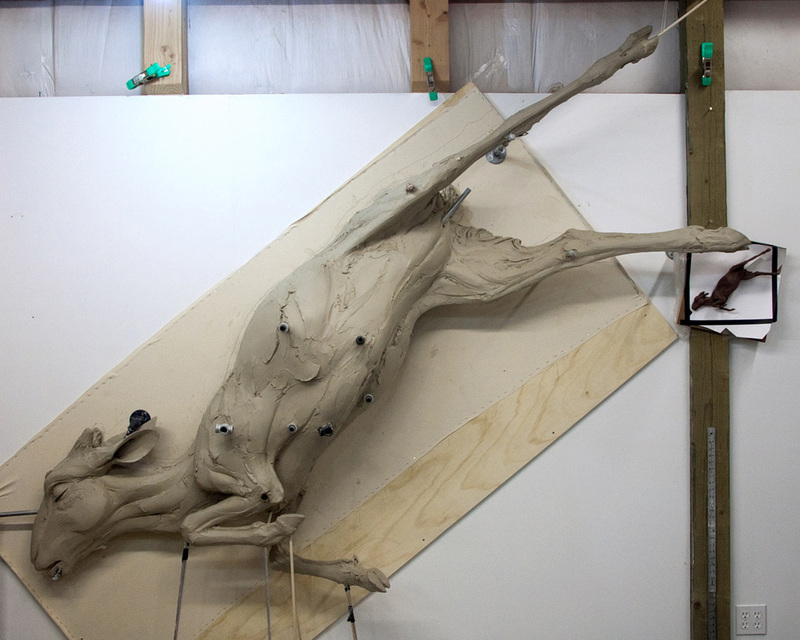 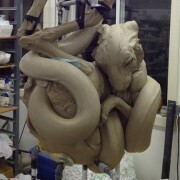 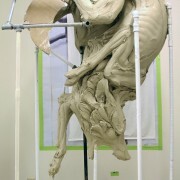 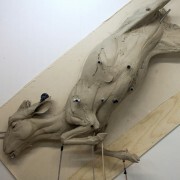 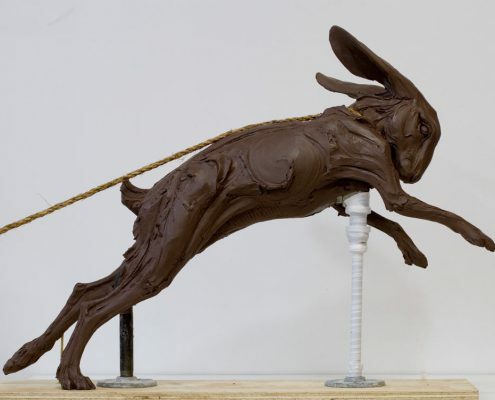 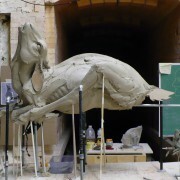 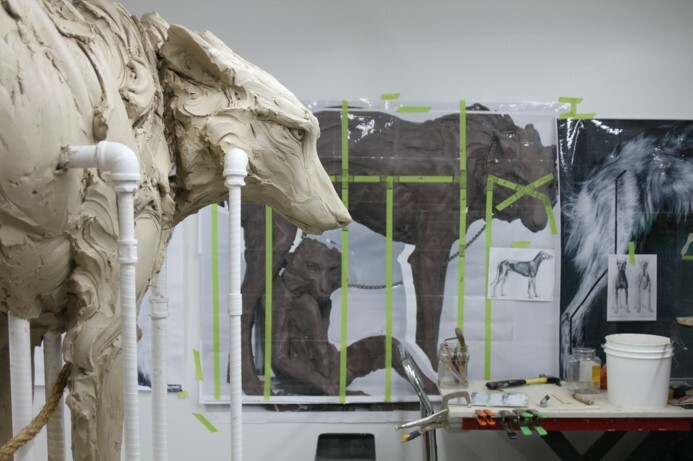 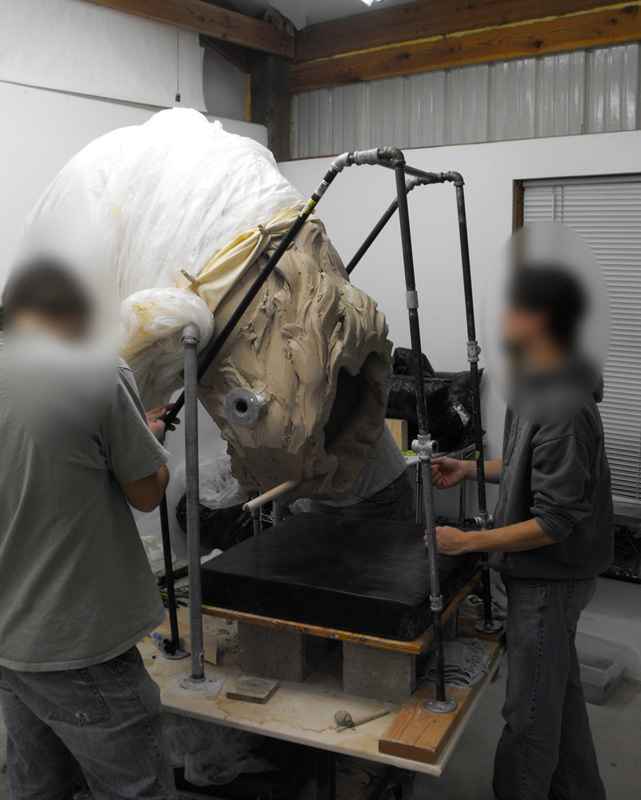 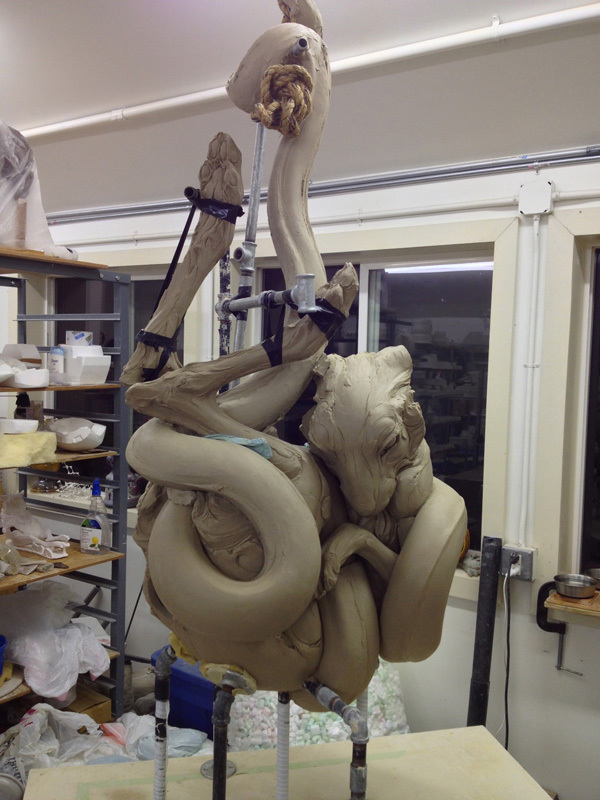 The hollow sections of the 21ft long anaconda snake and human-scaled hare were carefully joined into larger sections, then reassembled onto the original armature. 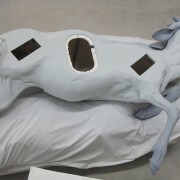 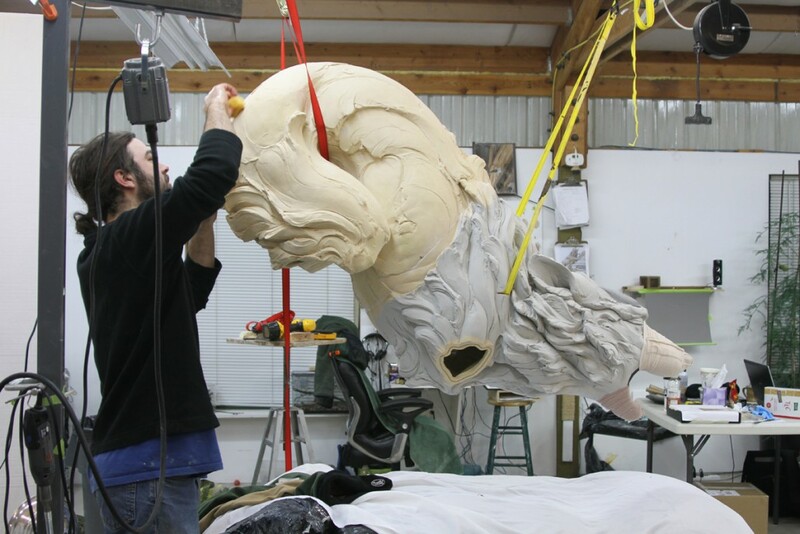 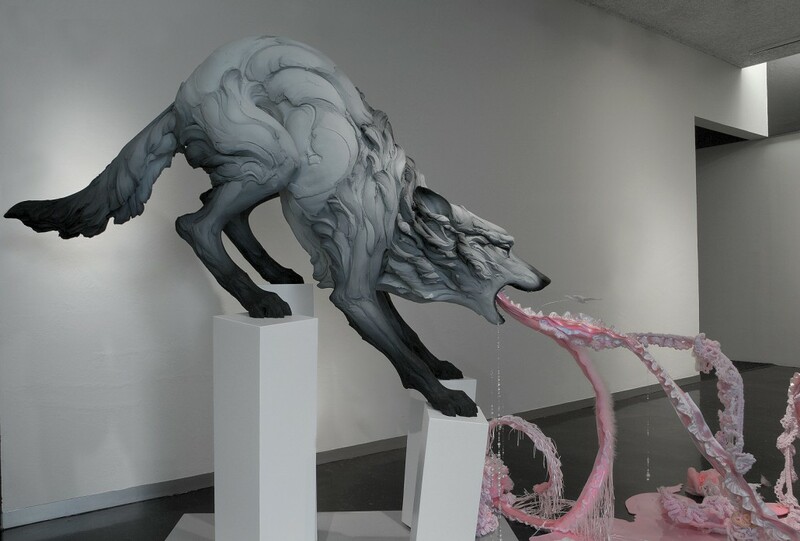 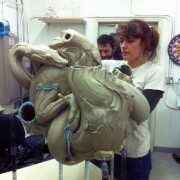 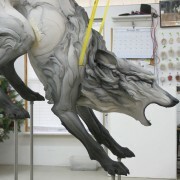 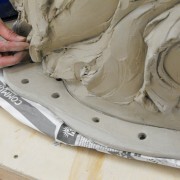 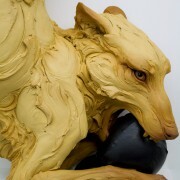 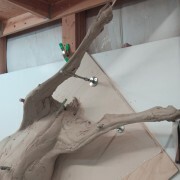 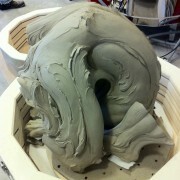 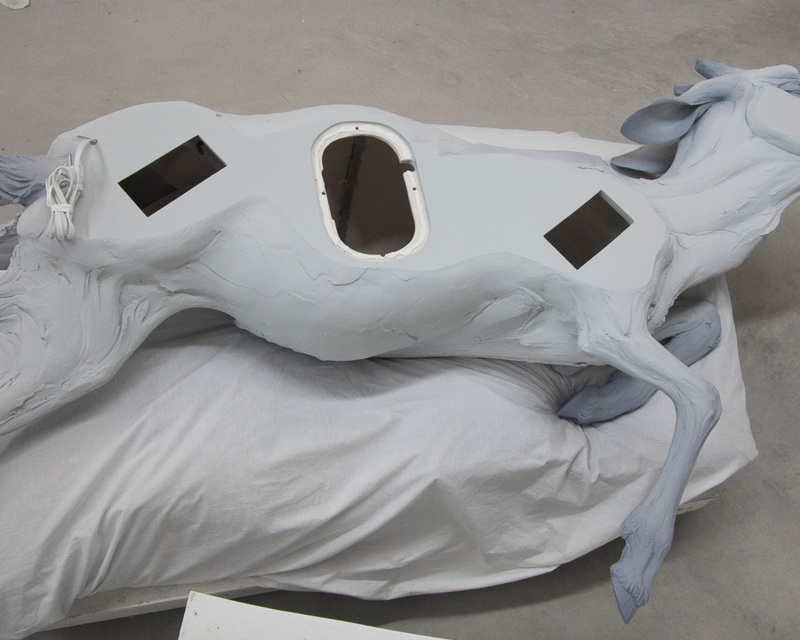 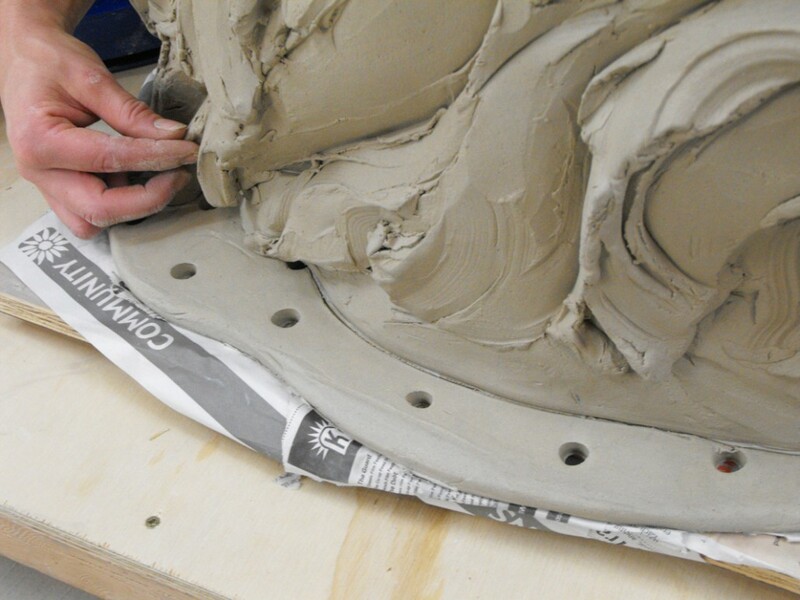 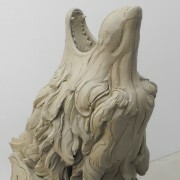 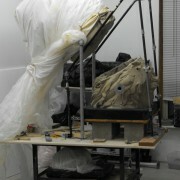 This ensures the sculpture retains the same flow and gesture after it is cut apart.